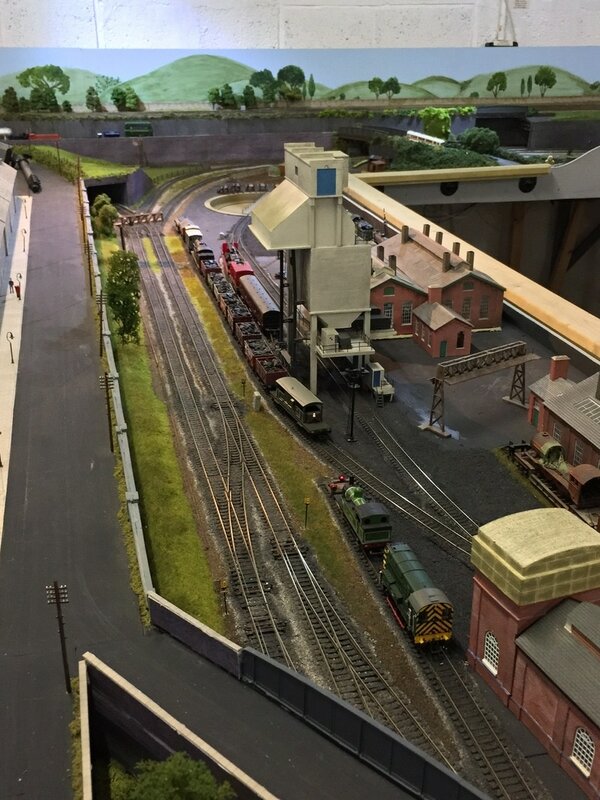 Our new layout will be approximately 44' x 20', and will feature twin-levels, a 4-track continuous run and a 2-track continuous run, main-line station, 2 locomotive depots, a peninsula and 2 fiddle yards. Design of the new layout is currently in progress. As of 12/09/13, all the baseboard frames have been built to an open-frame design, and track-plan design is now under-way on a section of the new layout. In the meantime, progress is being made refurbishing the other half of our premises, which will be used for a canteen, lounge area and layout storage. The accompanying pictures illustrate the design of baseboard construction, including a special design to incorporate a viaduct, and how low-level tracks will be incorporated into the layout around the high-level circuits. As of the end of October 2013, a complete circuit of track has been laid as a temporary measure on the lower level, to allow members to run trains whilst track is laid on the upper level. Sets of points that will form the junctions outside the main upper level station and also the entrances to the fiddle yards are being soldered together and placed on the layout in readiness for mounting point motors. Ramps to allow interchange between the upper and lower circuits have been built and are being grade-tested to ensure that stock can pass up and down them without difficulty. As of 1st December 2013, we have now completed construction of the footbridge over the left-hand end of the layout to allow easier access to the central operating area, and further progress is being made on installing tracks to the upper-level of the layout. We are hoping to have two complete circuits of tracks (one on the upper level, and one on the lower level) installed before the end of 2013. 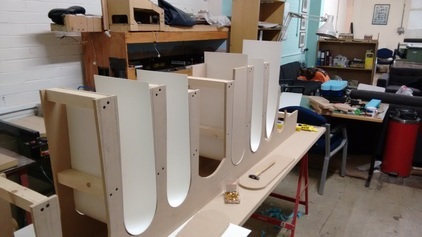 The wiring for the layout is now being installed on the upper level, and the trackbases are being cut as part of the open-baseboard method of construction. We have also finalised plans for a complex series of junctions at the end of the peninsula on the lower level, so that access from the peninsula to the lower-level circuit and ramps to the upper level is possible in both directions, and also to the lower-level fiddle-yard. Projects for 2014 include: installing more lighting gantries for the layout, completion of track-laying, and the incorporation and renovation of a further 20' 6-platform terminal station into the main layout. As of 7th January, construction of the lower-level fiddle yard has commenced, and track-laying on the upper-level is continuing, with the current extent of running now being between the upper-level fiddle-yard entry junctions. On the lower-level, two complete circuits have been completed, and the junctions permitting entry to the peninsula have been installed in readiness for electrical integration into the rest of the layout. The layout of the branch-terminus has also been laid out prior to track installation. 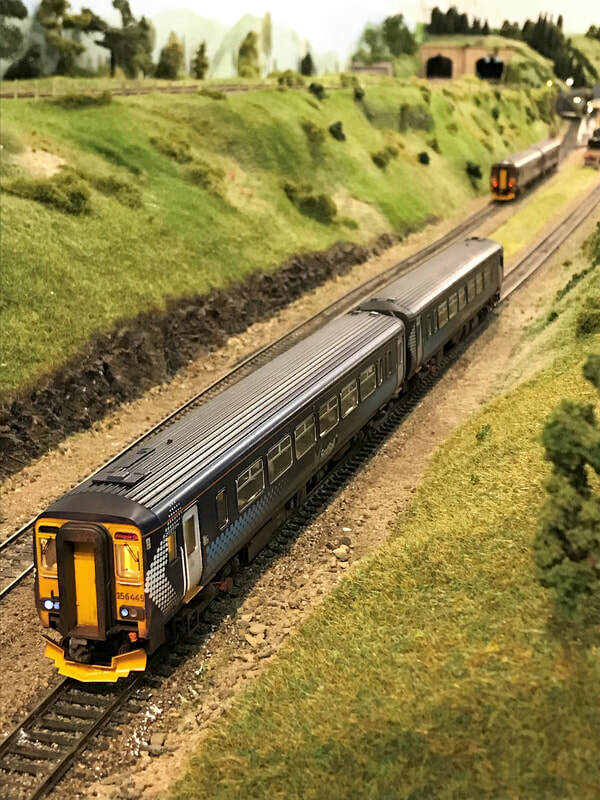 We are hoping to install a local wifi-network connected to the layout on a temporary basis to allow train operation on smartphones or electronic tablets. 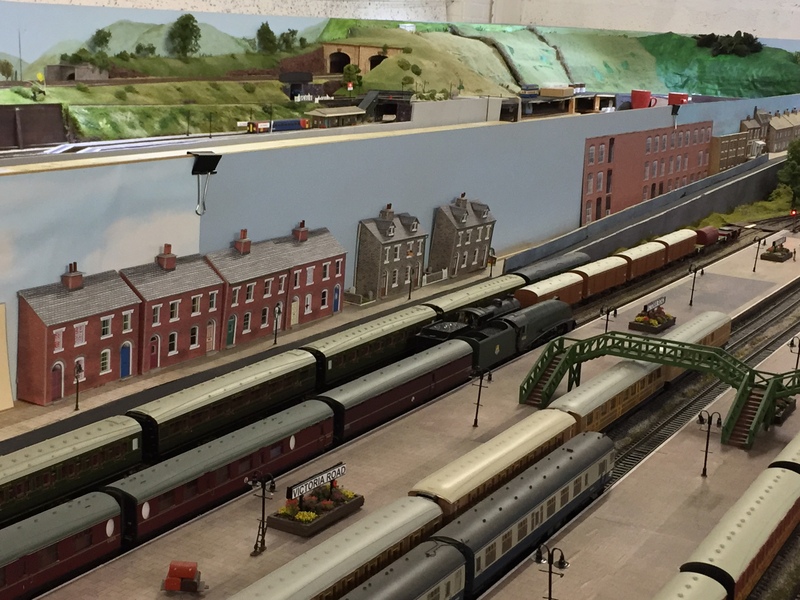 Away from the layout, carpet will shortly be fitted in the main operating areas, and a proper water supply will be installed in the early part of 2014. 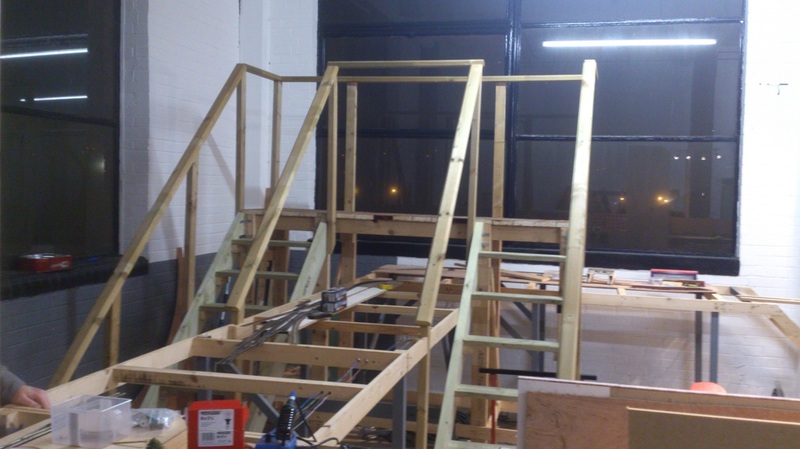 At the last club night (03/02/14) progress continued on building the lower-level fiddle yard boards, and we are almost ready to lay track in that area to then connect it to the current completed circuit. As can be seen in the pictures, more boards are being constructed for the upper level. In the picture (below), there will be a junction to allow access to/from the upper and lower-levels, connecting into the lower-level at the entry/exit to the peninsula, for which a station building has been obtained (below). 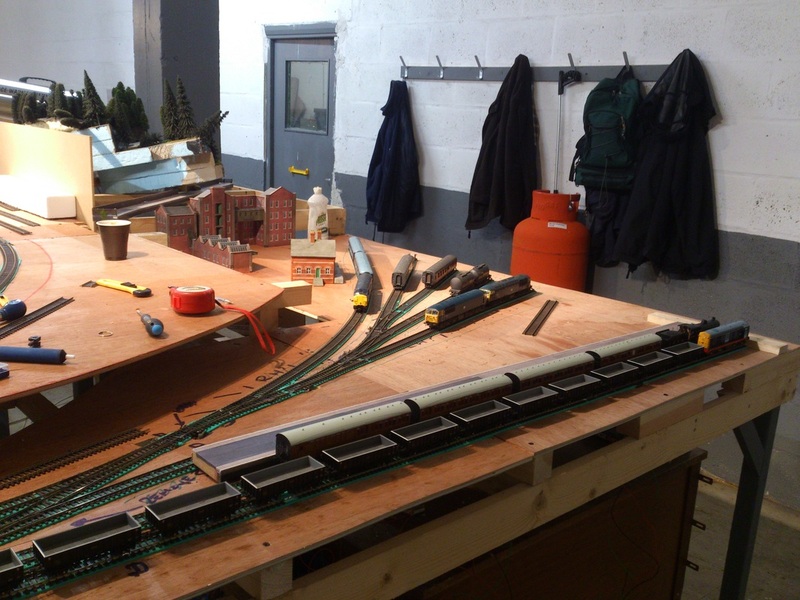 Away from the main-lines, a lower-level branch-line has been constructed and wired-up to add some more operational interest, and preparations have been made for further extensions of the layout away from the main circuits already constructed. 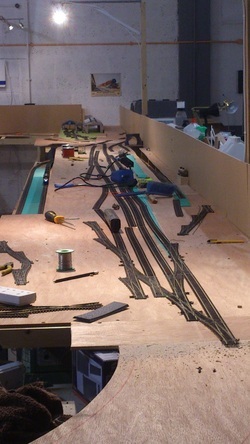 Progress has slowed on construction of the layout in recent weeks, but work has continued on the electrical-side of the layout - the main control panels are presently being installed, and controller plug-in points have been installed at various points around the layout. In addition, four complete circuits have now been installed on the top level, including a pair of ramps allowing access from the anti-clockwise lower level to the upper level, and from the clockwise upper-level to the lower level. Connections have also been laid to allow access from both directions to the upper-level fiddle yard at both ends. The effect of this is that up to 6 trains are now running simultaneously during club-meets! Over the course of May, more track has been added to the upper level fiddle yard, and planning has begun on one of the two diesel depots that will feature on the layout. In addition, a hole has been bored through the dividing wall between the two club rooms to allow a possible future extension of the layout! The extension will also incorporate two pre-built layouts, one of which will feature Woodhead-style overhead electrification, the other being a large terminal station with carriage sidings. The main focus for club-members over the past month has been to 'iron' out operational difficulties (e.g. short-circuits, etc) as this will mean less problems later on in the layout's development. Another installation over the course of May has been the installation of a Wi-Fi zone, which allows operation of the layout by mobile phone and electronic tablets, running through a computer with JMRI software. 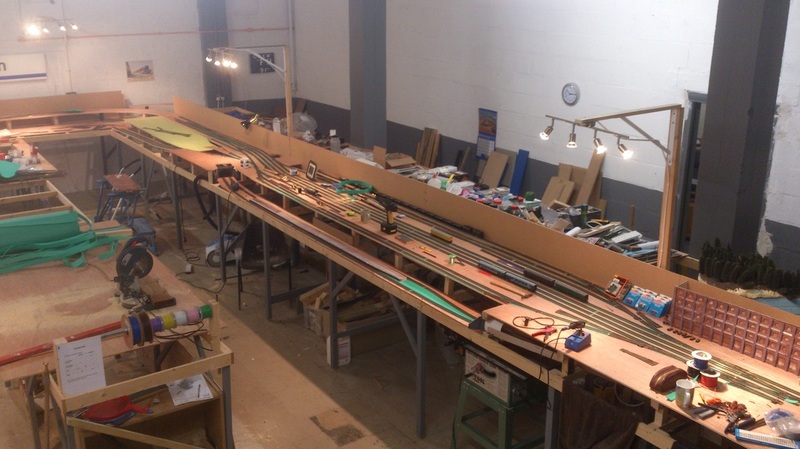 Over the course of June, we have worked on repairing a few elements of the layout to allow for more reliable running, namely warped baseboards, mis-aligned track, and of course the rolling stock! Away from the niggles, work has continued on the track-plan of the peninsula, as well as that of a second diesel depot. 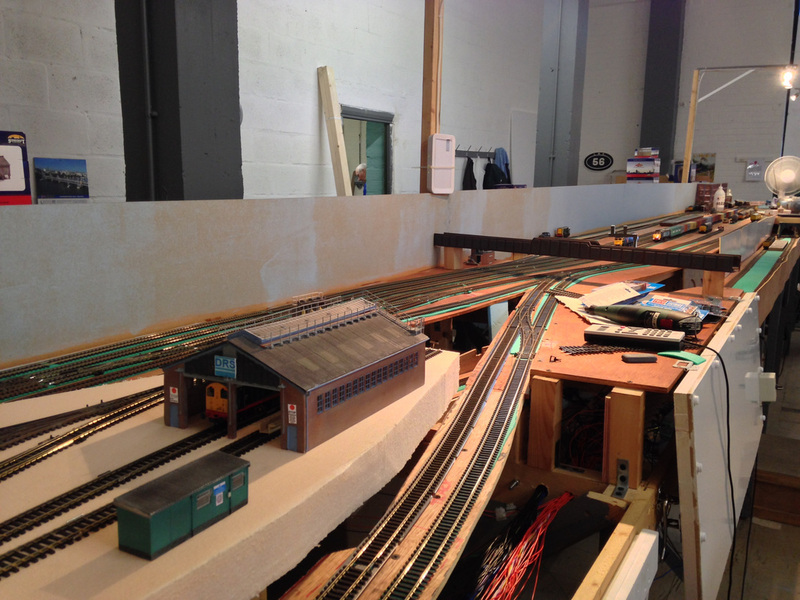 The track has been installed and wired in the primary diesel depot, and is ready for the addition of scenics. During July, a lot of progress has been made on construction of the peninsula: whilst the boards were built several months ago, track has now been laid and wired in the station approaches along with a few platforms, whilst planning of the track plan for the steam depot continues. In addition, the second of the two diesel depots that have been incorporated into the layout has been laid and wired, and now has scope for the stabling of up to 18 locos! Elsewhere, the layout in general has been tinkered with to improve reliability. The layout uses circuit breakers to split the layout into sections, so that if a problem occurs in one area of the layout, the whole layout won't shut down. However, this requires a physical gap between sections, so rails have had to be cut, then joined using insulated rail joiners. 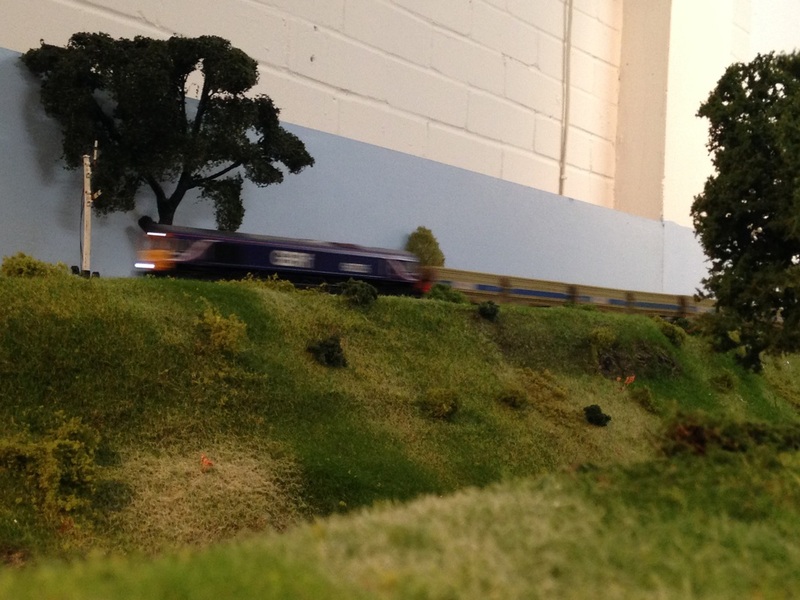 Away from the layout altogether, the club now has access to running water (! ), and a designated working area for working on locos or kit construction. Over the course of August and September, 95% of the track has been installed on the peninsula boards, and work on the wiring for this is now at an advanced stage. The last remaining track on the triangular junction that allows access to the Peninsula is soon to be laid, and, barring minor adjustments, will mean all the trackwork on the main section of the layout will be complete. Boards have been acquired for an extension of the layout, which will include a pre-built terminal station donated by a club member, and 20' of new boards. Space limitations will mean the boards which parallel the existing layout will be no more than 8" wide. Modifications to items of stock has also taken place, ranging from new destination indicators (left), and weathering, to sound fitting and reliability modifications. 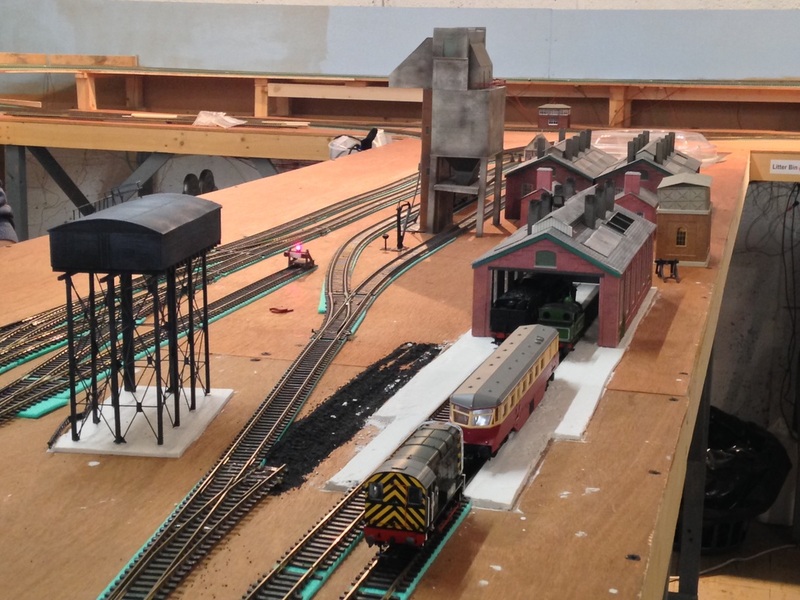 Much of the progress made during October has been on the peninsula area of the layout. 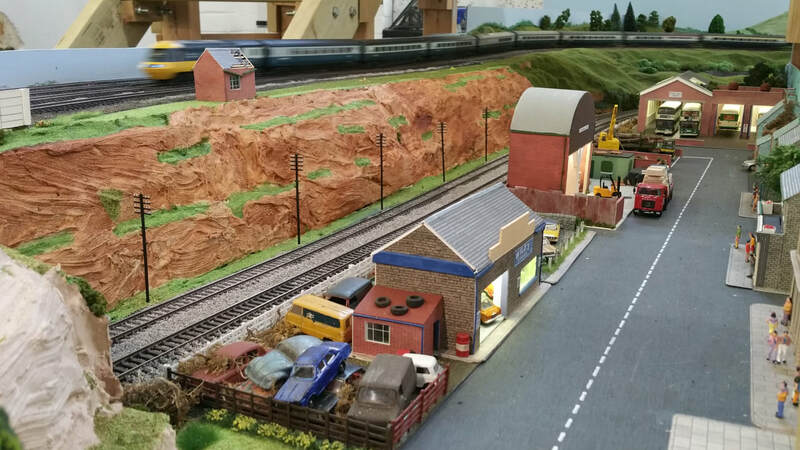 The triangular junction has been completed, the mainline trackwork in the station area and its approaches has been laid, and the steam shed is at an advanced planning stage. A start has been made on the scenery both in this area and in the adjacent corner of the layout (just out of shot on the right). Elsewhere, further refinements have been made to the trackwork, as due to temperature changes, rails have started to contract, meaning joints have required adjusting. 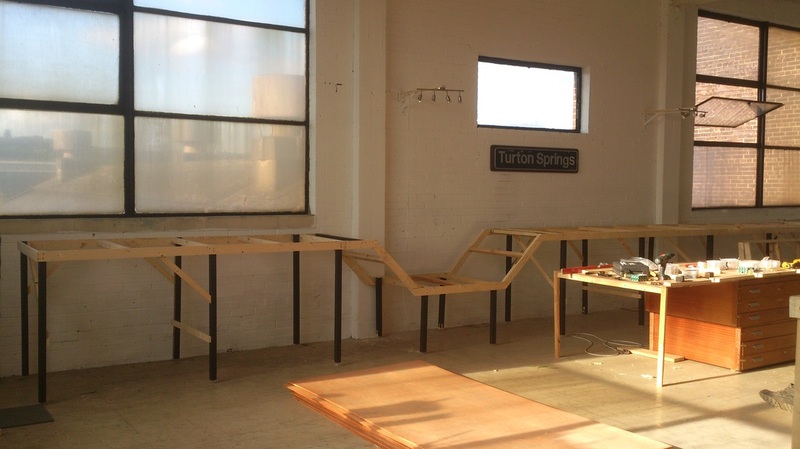 The high-level fiddle yard has now been completed, and shelving erected to store various tools and boxes that will be required at later dates. 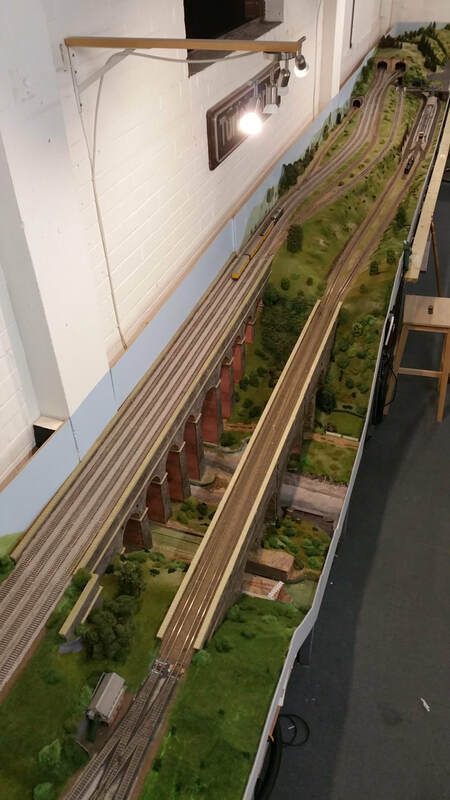 Away from the layout, the club's eldest member is putting the finishing touches to a 9'x6' layout, a project that has enabled newer members to be given tuition on various aspects of railway modelling. In addition, it has allowed variation of traditional construction methods and different modelling techniques to be experimented with. 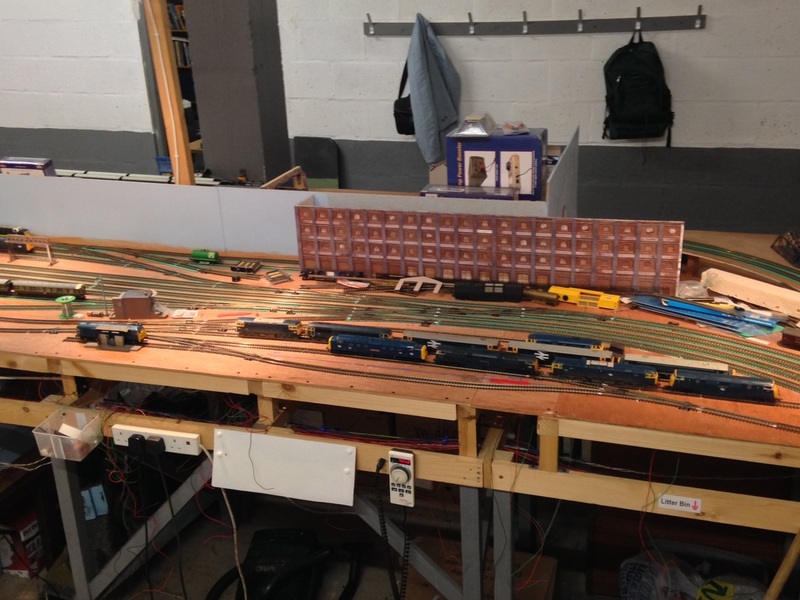 During November, further circuit-breakers have been installed to the layout to improve the running reliability. Using handbuilt breakers from MERG kits, this splits the layout into several electronic sections, so that should a 'short-circuit' develop in one area (e.g. through a train derailment), then it will not affect the rest of the layout. 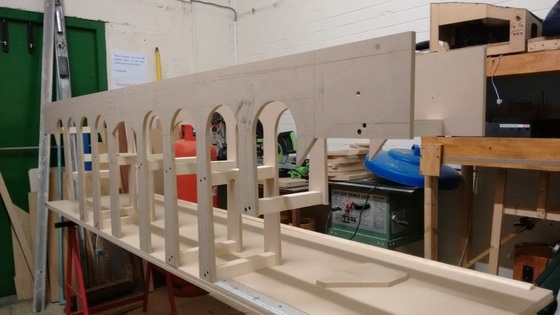 Work continues on the development of the peninsula station area, with Scalescenes platforms being glued to MDF bases pre-cut to fit, as well as the planning of a Faller car-system to be incorporated around the railway. Elsewhere, a station is being constructed on the lower-level, but using different construction techniques - a card framing sets out the shape and size of the platforms, which is glued to the baseboard, before being covered with Scalescenes platform textures. The process of ballasting the layout is likely to be a long and laborious task, but some work has taken place on the upper level around one of the entries to the fiddle yard, as well as on a section of the lower-level. 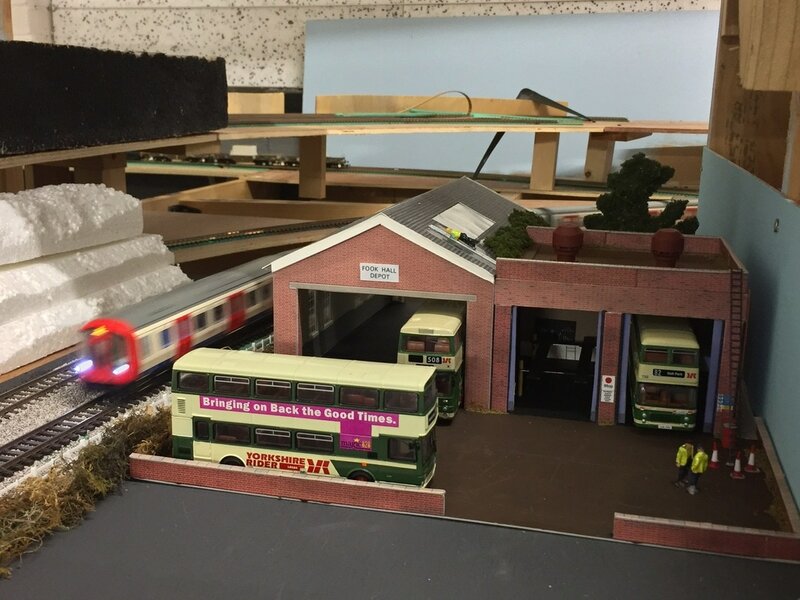 Also in the process of having scenery developed is one of the diesel depots on the upper-level. 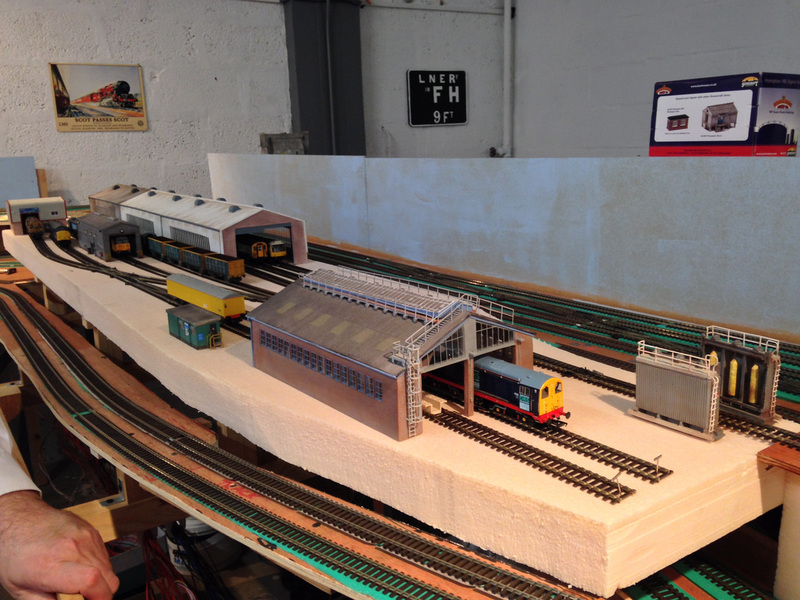 Buildings have been planted, and selected areas of the depot yard are being 'tarmac-ed', using plaster. This will then be painted and marked-out. Due to the Christmas and New Year period meaning the club missed a few meetings, progress has slowed. 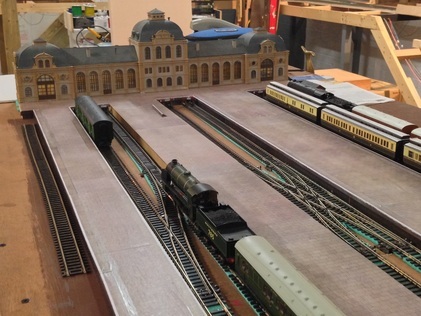 However, various projects involved in the construction of the layout have continued. 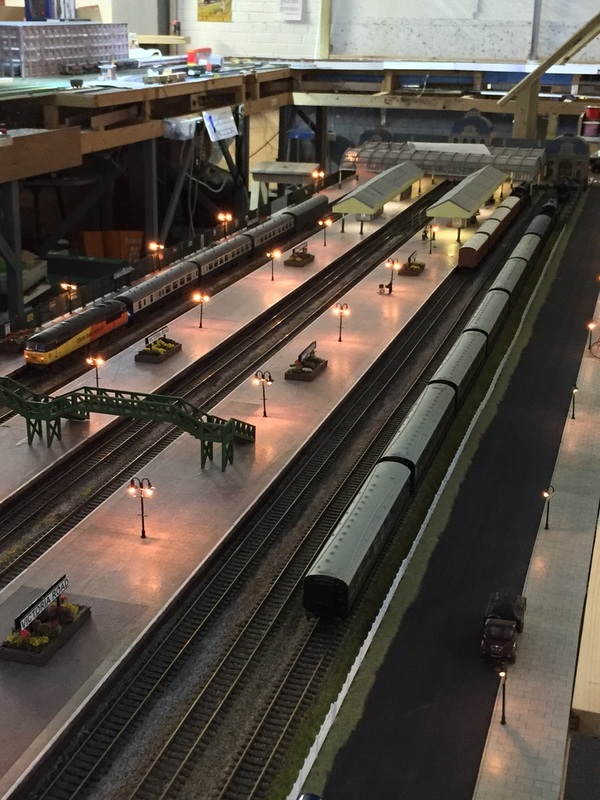 On the peninsula, an overall roof, assembled from Peco kits, has been constructed by our Secretary, along with a series of Metcalfe station buildings and Scalescenes platforms. 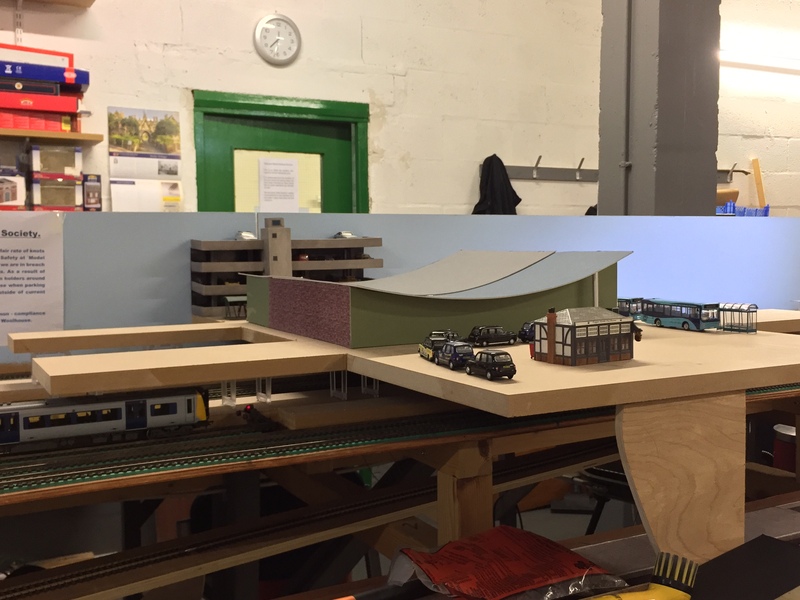 Elsewhere, our Chairman is starting work on the scenic aspects of one of the diesel depots, part of which is located above one of the upper-lower level link lines. Before any more major ballasting work can be started, minor refinements need to be made to trackbeds and the track itself. Due to the nature of the clubrooms, the track is susceptible to heat changes, and expansion joints that were once tightly closed in the summer months are now quite wide. 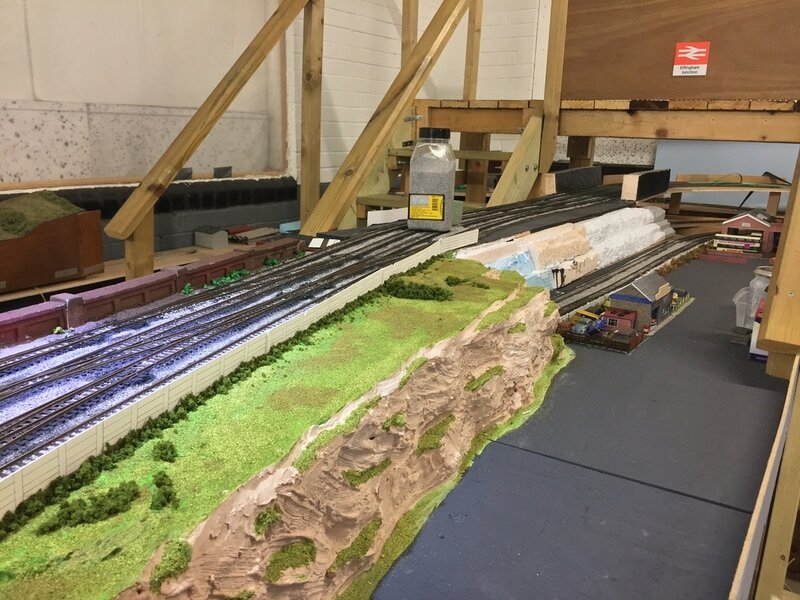 Since the last update, work has been undertaken on adding scenery to the back section of the layout, progressively working away from the viaduct boards towards the far corner. The next task to be undertaken will be the creation of a town scene above the railway, with a link down to the station in the lower level. 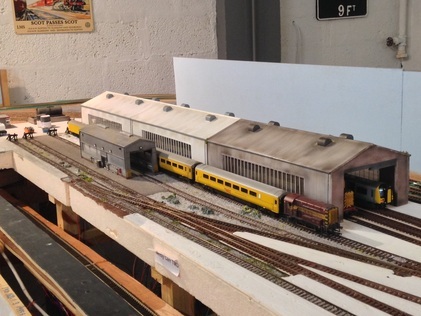 The area around the back of the diesel depot on the upper level has also been built-up, using a plaster base, before being given a base coat of brown paint and flocking laid down. 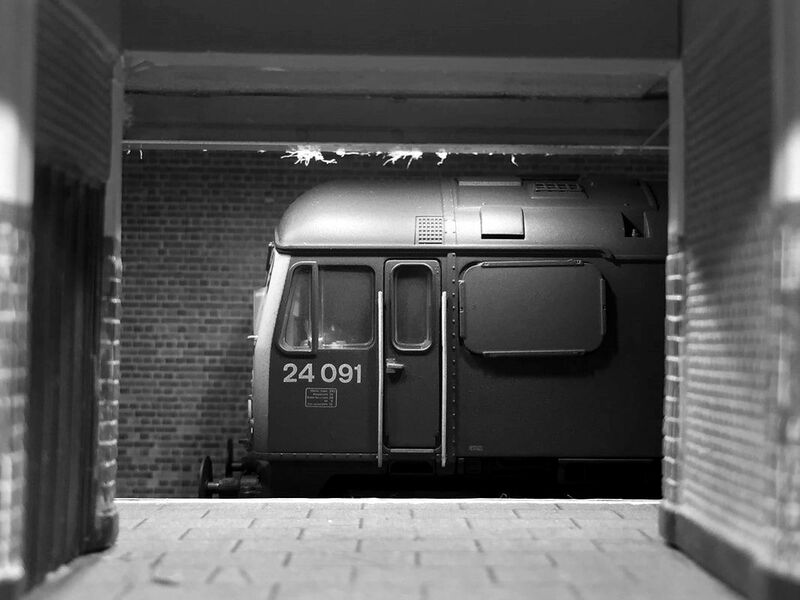 A key issue continues to be the running quality of trains on the layout. This is down to the atmosphere in which the layout is kept, meaning there is a lot of dust which then makes the track dirty. This is then picked up by the trains, thus exacerbating the problem. Whilst the club possesses several track cleaning vehicles, they are only effective to an extent; the best cleaner in our experience is a CMX tanker, which dispenses cleaning fluid whilst being propelled along the track by a suitable loco. The Dapol /Atlas electric cleaners are good for removing dust and dirt from the layout too, but are temperamental. 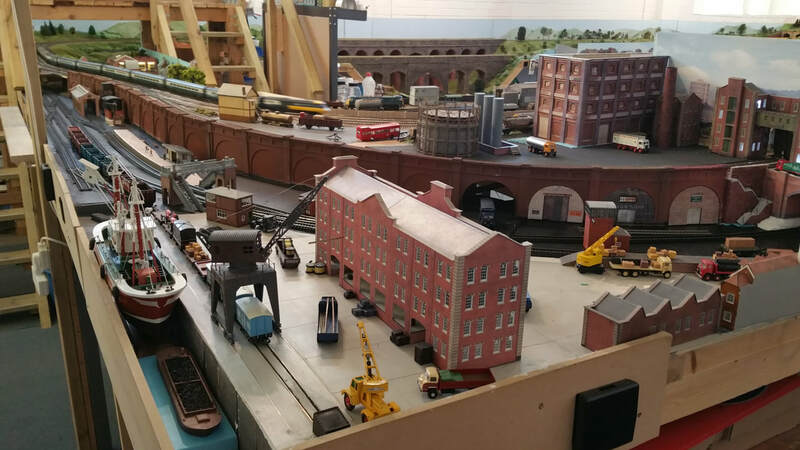 The front corner of the layout on the lower level is in the process of being converted into a dockyard, reminiscent of the systems that used to exist all over the country up to the 1960s, including Birkenhead, East London, and Weymouth. 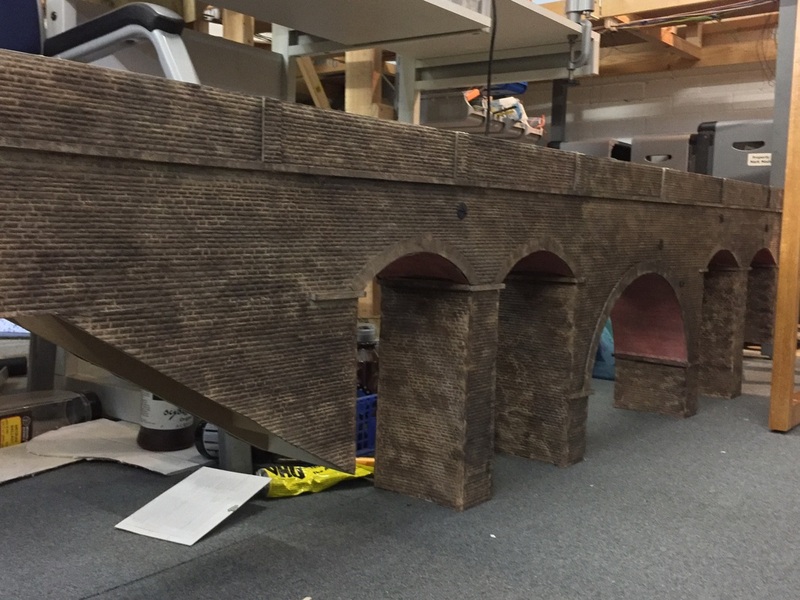 Aside from building up the scenery, major tasks that are still to be completed include ballasting and adding further framing to dipped baseboards - particularly in the main station area on the upper level. The major talking point of the past few weeks has been the construction of a key element of the layout: the four-track viaduct which will take the upper-level tracks across a valley on the back-section of the layout. 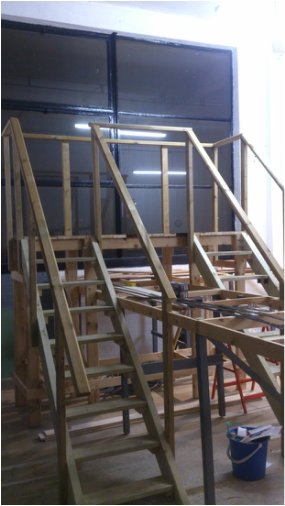 The framing has been constructed from 12mm MDF, with spacing beams screwed between the sides to allow for the four-track bed to be slotted in. The arches are currently being covered with card to give an inside framework, before the entire structure is covered with plasticard. A decision is still to be made as regards whether the viaduct will be of stone or brick construction. 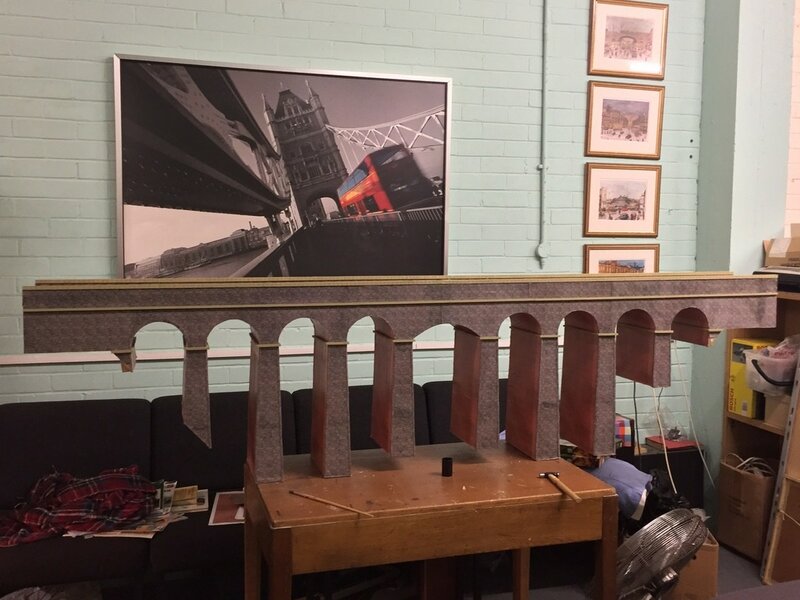 The viaduct is 8' long, 10" wide and 2' high, and inspiration has been taken from various sources, including prototypes such as Hanwell Viaduct on the Great Western Mainline, and viaducts previously built by other modellers, including Peter Goss's 'World's End'. 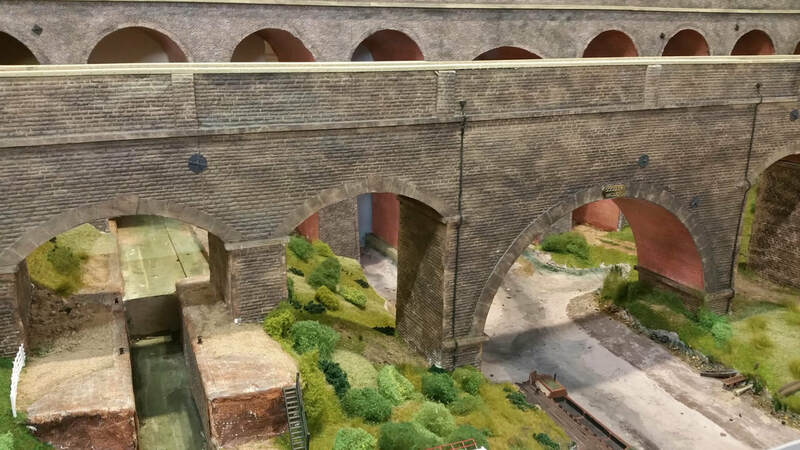 Over the course of the past month, the two viaducts that have been constructed have been slotted into place - these will remain in situ whilst other projects relating to the layout are undertaken, with the cosmetics to be completed at a later date. The framing and bases for the road network around the peninsula have been put into place pending further scenic work. It is intended to install a tramway and a Faller system to allow additional interest outside the 'traditional' railway boundaries. 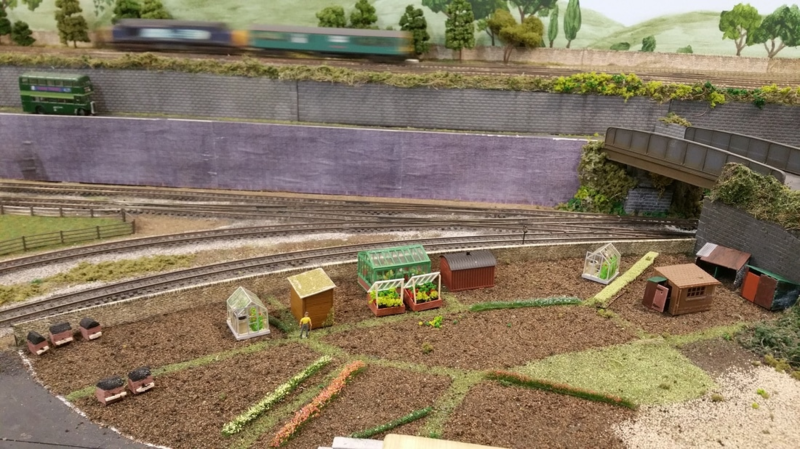 Elsewhere, individual members have been working on scenery in various parts of the layout, including a country house and orchard, signalbox, dockyard and industrial area, and countryside. 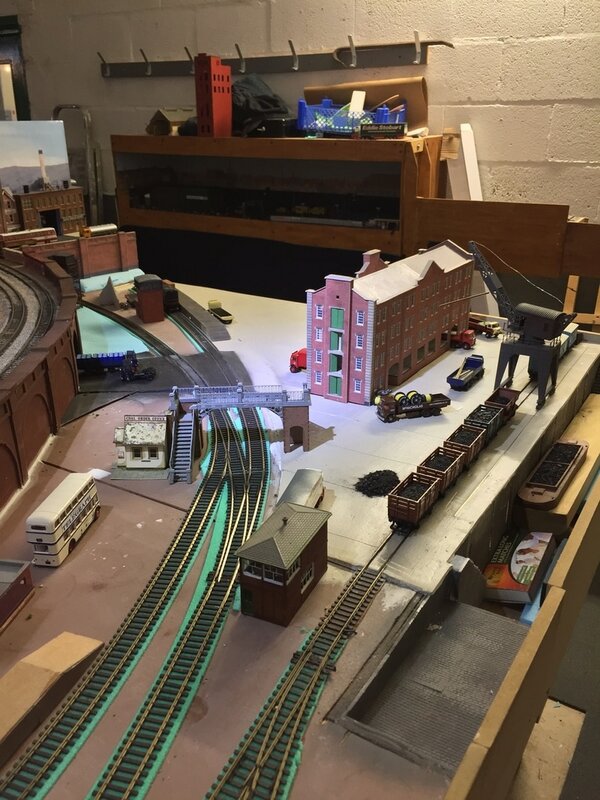 Over the past couple of months, members have been working on various sections of the layout. In one corner, two members have constructed a retaining wall, and are now planning a dockside yard. So far, point templates have been put in position, and the baseboard has been amended to allow for part of a docking area to be modelled. 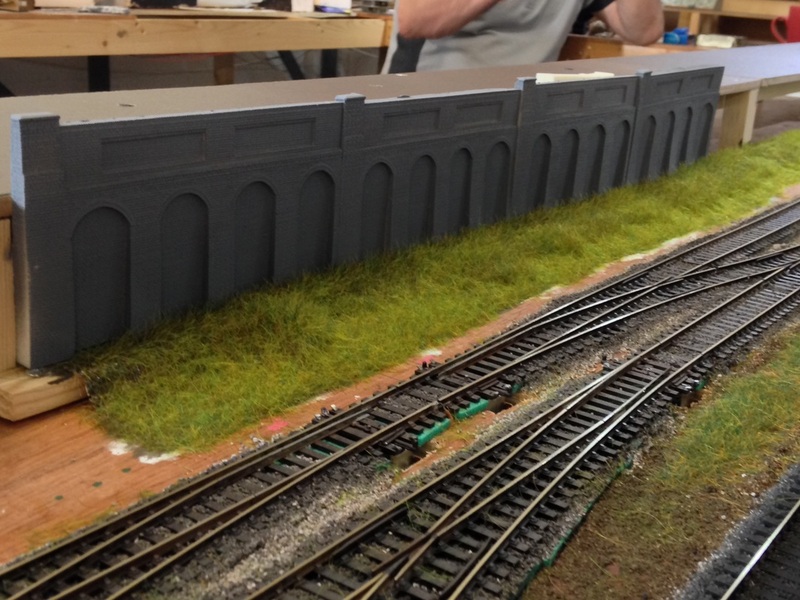 As a means of keeping layout costs and building time down, the club has been experimenting with making 'moulds' of key items of scenery, such as platform edging and retaining walls. Some of the results can be seen on the lower-level peninsula, where retaining walls have been installed (see below). An example of a mould is shown (right). 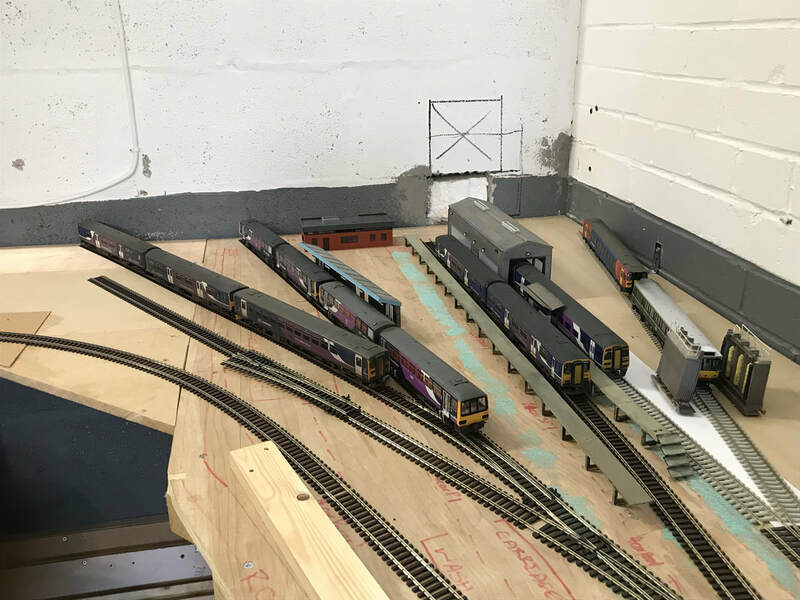 Away from the main layout, a layout that is in the custody of another member is now being expanded, with the potential to be connected to the main layout - this will be some time off though! ​Since the last update, the society went on a day trip to Scarborough, taking in a ride behind ex-LMS 'Jubilee' no. 45699 'Galatea' on the Scarborough Spa Express from York to Scarborough via Castleford. Unfortunately, the weather was cold, grey and wet - not the best day to go to the seaside! However, a good day was had by all that went. Back to the layout... Construction of a further extension to the layout has begun. This will incorporate a further low-level fiddle yard, with the potential to extend into the other clubroom at a future date. Above this will sit a fully-scenic board, with a modern DMU-servicing depot, along with a branch-line terminus. The total area of this board will be approx. 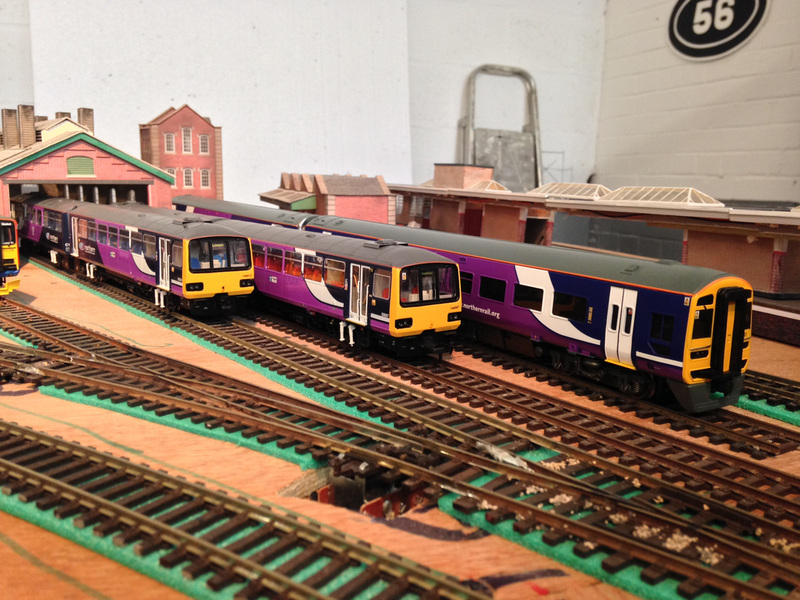 15" x 6'​ at its widest, and will have space for 8 2-car DMUs. The Faller system on the peninsula has been extended slightly, although is not complete. The main roadway has now been painted, and buildings are starting to be planted. At present, a Faller MAN coal-lorry, a converted Leeds Corporation Leyland PD3 and a kit-built Rotherham Corporation AEC Regent V (converted using the chassis from a Faller bus) are the only vehicles that can use the road system, but as with all collections, this fleet will be built up gradually. The dockside is also progressing well, with the dock itself being the focus of construction at the moment. This is being scratchbuilt using thin sheets of foam-board and ​​balsa wood. The track has been laid, and is now working. 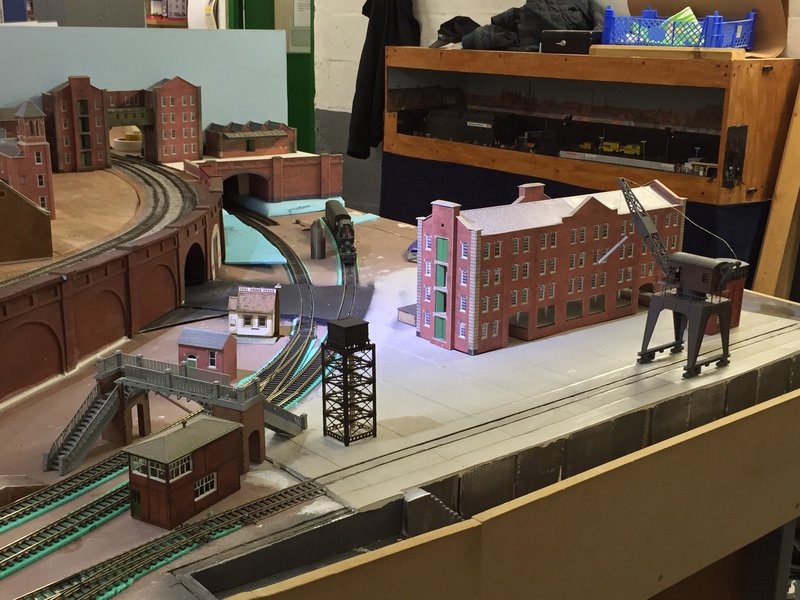 ​A (belated) happy new year to our followers from Neepsend Model Railway Society! ​A month into 2016, and the Faller car system is nearly complete - a full circuit has now been installed, and all that is now required is some fine-tuning with certain road vehicles. The road vehicles are capable of a scale 30mph, and the effect of moving objects outside of the railway boundary adds a great deal. The main road on which vehicles pass is now nearly complete, as a row of houses has been installed on the top section. 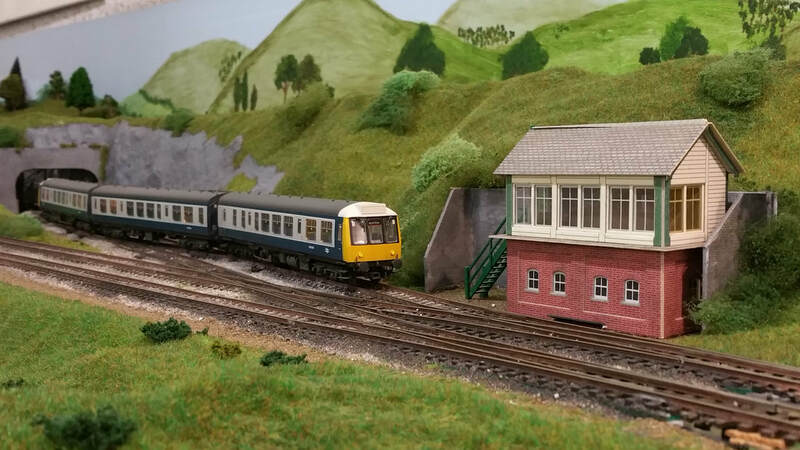 ​Near the new Faller terminus, a hillside has been built-up to disguise the severity of the curves in the far corner, and also to allow various options of scenery to be built on-top of the running lines, be it a town scene or a more rural setting. The hillside has been constructed using a wire-mesh frame, covered with plaster bandage and Mod-roc. 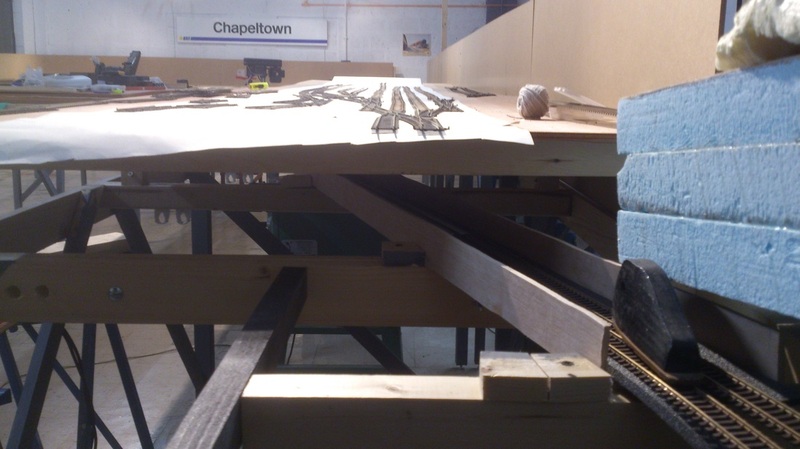 In a bid to improve the usability of the upper-level fiddle-yard, a pair of cross-overs are to be installed shortly to allow crossing of trains between the up and down lines. Also, the lower-level viaduct has been taken out to be covered with Wills stone-paper and be painted. ​Another key event in the past two months has been the installation of a heating system to the clubrooms - previously the use of gas fires had been required. ​​Since the previous update, progress has continued on the lower-level viaduct, and it is now almost complete. It has been painted, weathered, had detail fitted, and requires only a couple of final touches before it is inserted back into the layout. Once that has been done, the upper-level viaduct will have the same treatment. ​The Faller car system is also nearing completion - only the turning circle needing some fine tuning. At present, the club possesses three vehicles to run on this track (two buses and a lorry), so now begins the process of collecting more! ​On the peninsula, lighting has been fitted and installed on the station, and also a working zebra-crossing next to the station. ​Elsewhere, the quayside is progressing, with trackwork laid, and work on building placement and construction taking place. The large gap in between updates was due to your webmaster's work commitments, largely playing with full-scale trains! Since the last update, the Faller car system has been completed, with a full circuit running from the lower level station 'Deepdene', down to the front of the terminus on the peninsula. 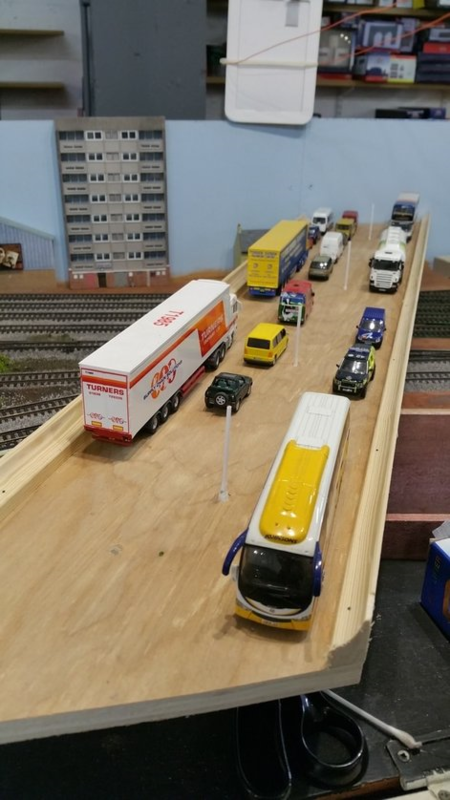 At present, the club only possesses three vehicles for running on the Faller, namely two buses and a truck, but hopefully more vehicles will be added to the fleet soon. Also, the turntable in the steam shed on the lower level has been fitted and is now working. A Heljan unit, the control unit is located next to the control panel for the station throat on the peninsula. Elsewhere, the dockside on the lower-level is taking shape, with all track down, buildings placed for planning, and construction underway on the dock itself. Also, a branch from the lower-level is being constructed. Taking inspiration from the Barton-on-Humber line, it will be a single track, with the corner section being based on New Holland. 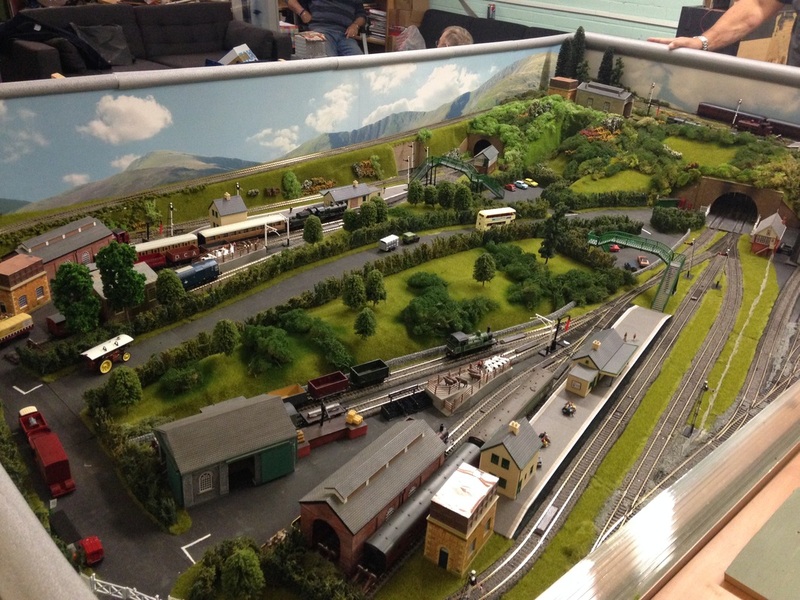 A layout donated by a club member is also being worked into the project. The theme of the recent upgrades to 'Effingham' has been signalling. On the lower level, signals have been installed at each platform on the terminal station on the peninsula, as well as a three-aspect colour light with junction indicator at 'Deepdene' (right). To control the signalling on the peninsula, a special control panel has been constructed, complete with signal repeaters. The control panel also has a 'stud and pointer' system for route-setting. Ultimately, the aim is to have this system on the control panel for the main part of the layout, although the signal repeaters may have to be omitted! The lower level viaduct has been completed, with final details fitted. This includes ballasting, weathering, and having finer details fitting. Elsewhere, the lower-level dockside area is progressing nicely, with buildings assembled and positioned, the tarmacked areas having been marked out and plastered, and dock constructed. Since the last update, the upper-level viaduct has been removed for detailing. The work includes covering the wood base with brick paper, weathering, and fitting of finer details such as drainpipes, etc. Whilst this means that running trains on the layout is now confined to the lower level for the time being, it means that work can commence on other areas of the upper level without causing more blockages! The upper-level station is now being planned and constructed. A station building and forecourt will be above the running lines, with a taxi-rank and bus stops also being present. 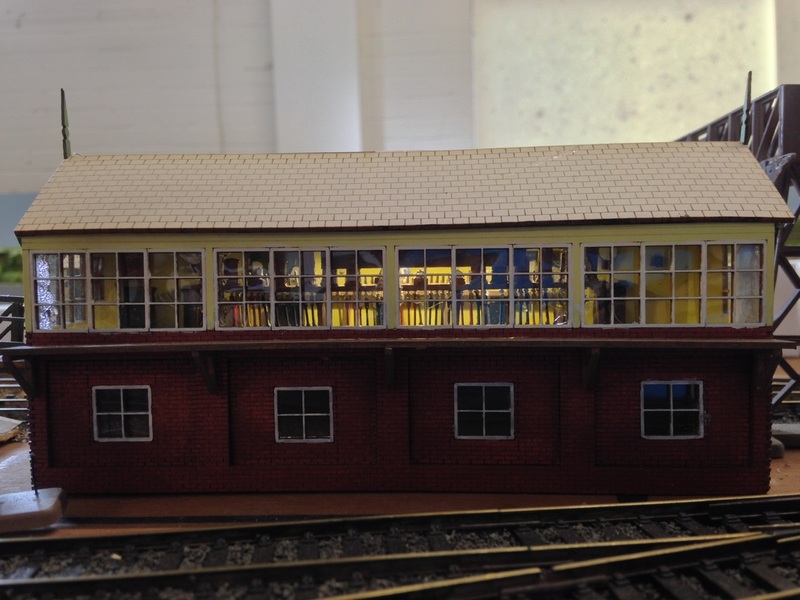 A mock-up of the station building has been made from card - the plan is for a modern glass and concrete structure. On the peninsula, more buildings have been added on the roadway alongside the station. 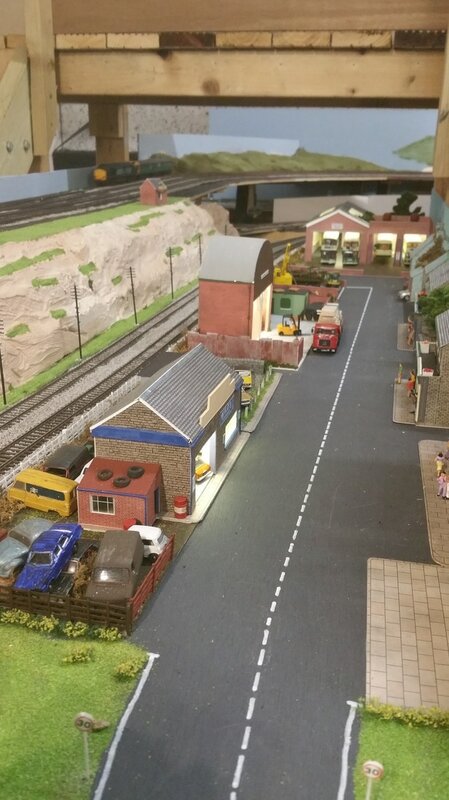 A mixture of Metcalfe kits have been built by one of our newer members, and feature fully-detailed interiors, and have had lighting installed by our resident secretary. Upper-level running is hopefully going to be resumed by the end of the year, with the 4-track viaduct being replaced after being detailed. Since it was built, it has been a 'naked' frame, but has now been covered with brickpaper from Country Scenics (unlike the lower-level 2-track viaduct which used Slater's plastikard) and had other details fitted. Built around a wooden frame, once fitted back into the layout it will allow sculpturing work to begin on the valley which it spans. 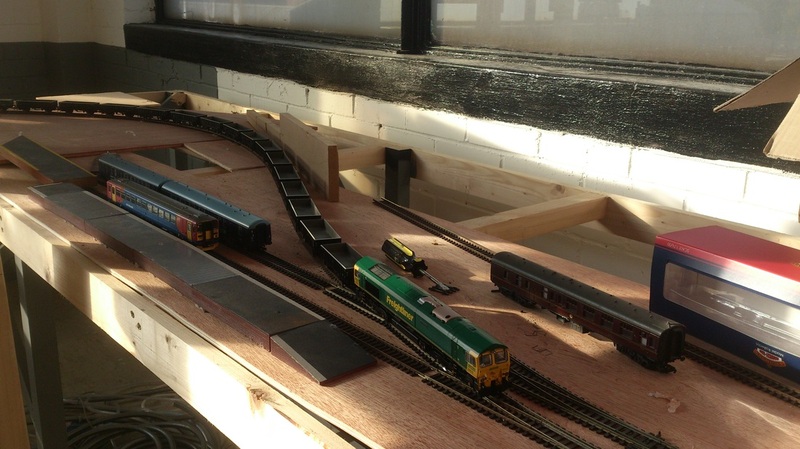 One of our newest members has been working on an area of the layout on the lower-level near the footbridge. Using buildings made from a mixture of scratchbuild and kitbashed Metcalfe models, including a bus depot, car dealership, scrapyard and houses (each with fully-detailed interiors); a quiet suburban scene is coming together. A hillside and cliff-face has also been built up from polystyrene and papier-mache, painted and covered with flock. Meanwhile, other members have taken the opportunity of no trains running on the upper level to ballast some of the track. 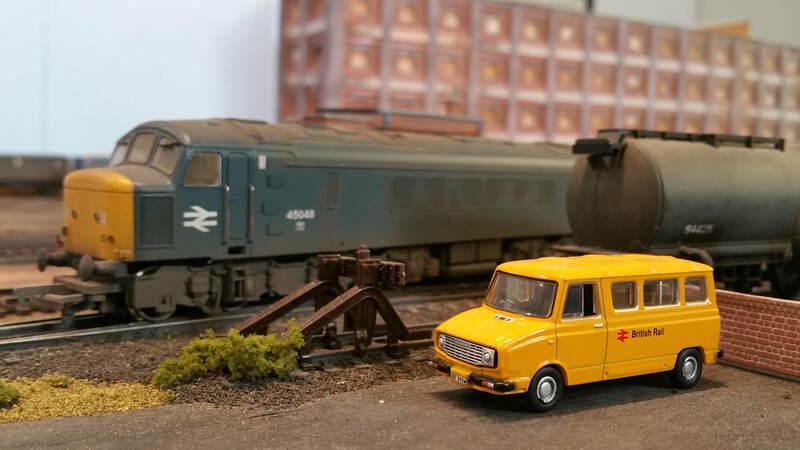 For this a tub of Woodland Scenics medium ballast has been used. The track will be weathered in due course. In one of the upper-level diesel depots, working buffer-stop lights have been fitted, and plans are in place to put 4th rail on certain sections of the lower-level. Since the last update, most of the layout has now been ballasted, and is ready for weathering. Minor adjustments to the track need to be made in specific, hard to access areas (such as the upper-to-lower level ramp on the back wall), but these are in the interests of long-term reliability. One addition since the last update has been the expansion of the lower-level fiddle yard. This has taken the place of a couple of rows of shelving, which were being used to store empty stock and ready-to-plant building boxes. This will improve storage space by approximately 25%, and in the long term may lead to further expansion of the layout. 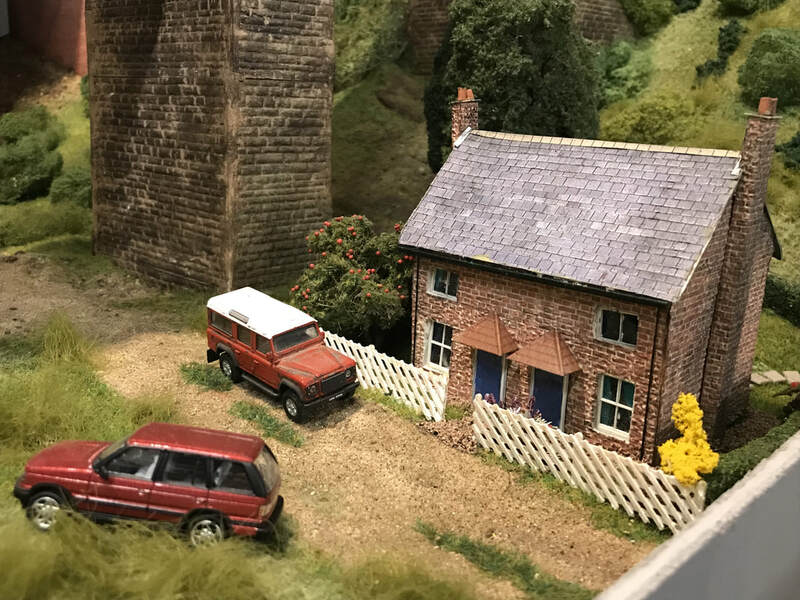 Elsewhere, a branch-line leading off the lower-level behind the footbridge has had the basis for scenery glued into place, and had track laid, so it now connects into a separate layout donated by a club member. Approximately 10' of the extension will be on an embankment, constructed from foamboard glued onto a dropped baseboard. The foamboard will then be covered with construction bandage, painted, and then covered with Woodland Scenics flock. The dockyard has been tarmacked, and is in the process of having buildings planted. In addition, a barge has been built and painted, in readiness to be planted in the dock itself. A technical development is that a new master control panel is being constructed. This will give overall control of the layout, with smaller panels to control small sections (e.g. the diesel depots, the dockyard, and Victoria Road station). 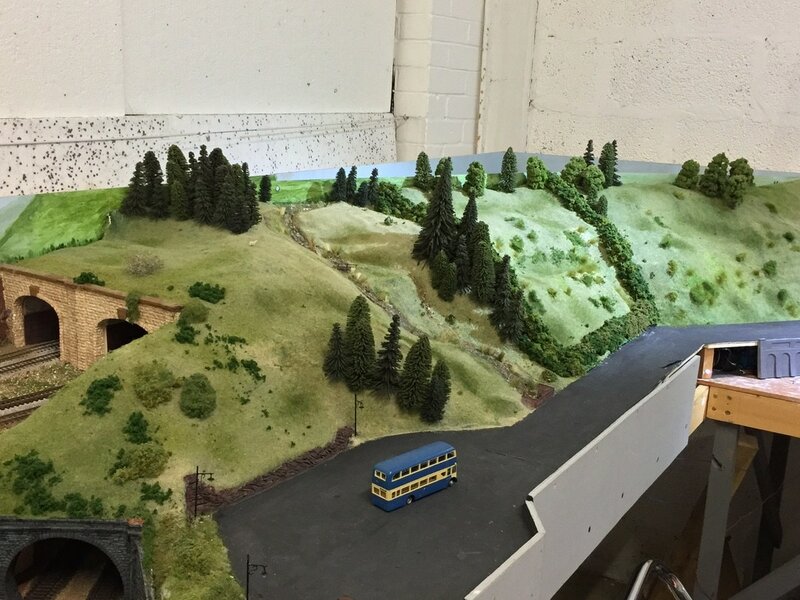 Over the past 2 months, work has continued on adding detail and scenery to the layout. The corner behind the footbridge has been landscaped, flocked and painted, with only a short section on the lower-level still to be done. 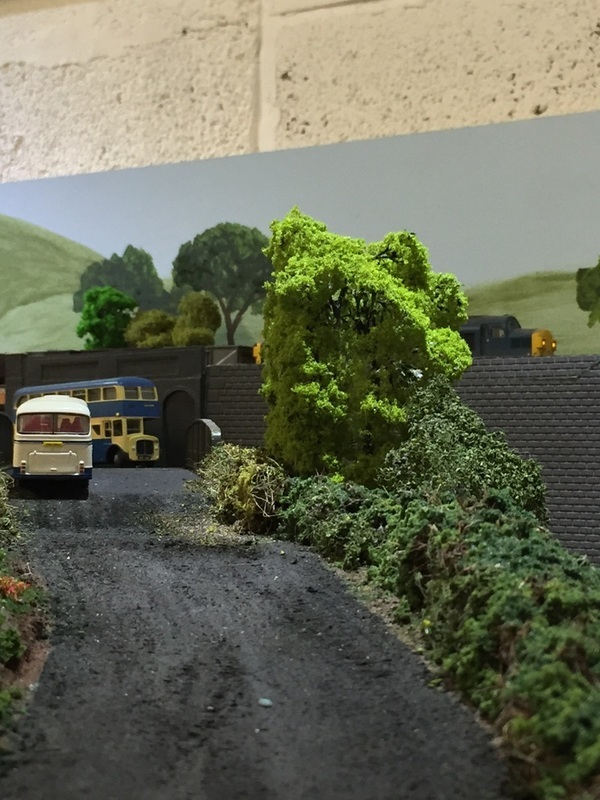 An embankment has been built for the extension past the side of the footbridge, which will enable the connection of two pre-built layouts (donated by a cub member) to the main layout. 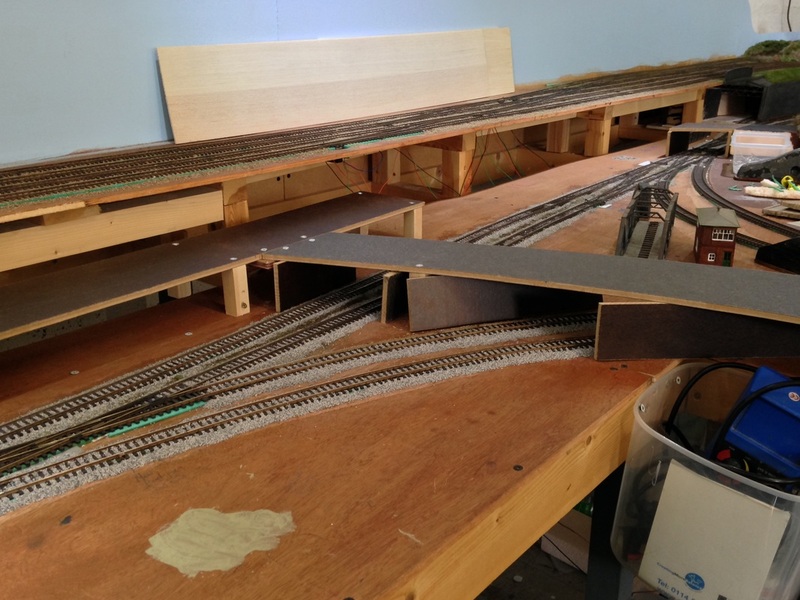 In addition, it is hoped to create a further loop through these layouts to connect to the end of the lower-level fiddle yard, although this is quite far down the list of priorities at the moment. Elsewhere, a modern concrete bridge is being constructed (from wood! ), and will be located at the northern end of Effingham Junction High Level station, with the main station concourse also taking shape. 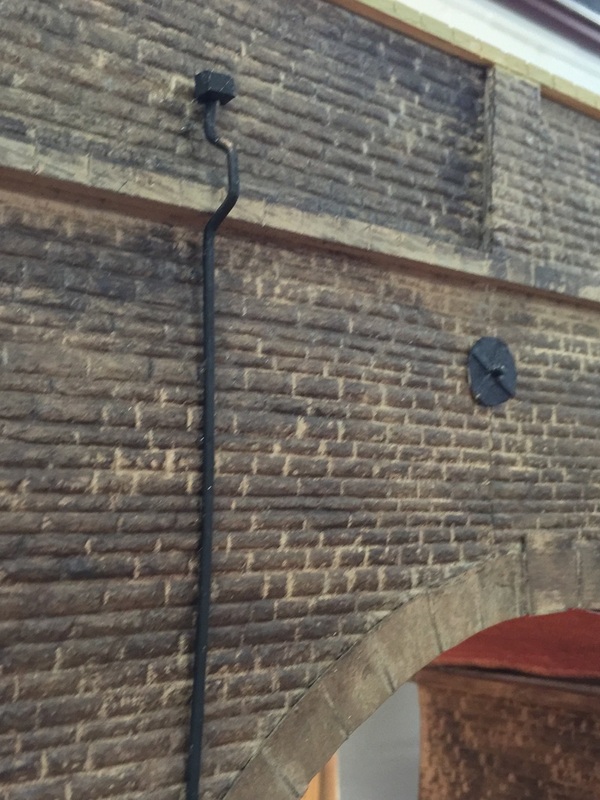 Detail is also being added in the vicinity of the viaducts, with a canal (including locks), river and roadway being modelled under the arches. 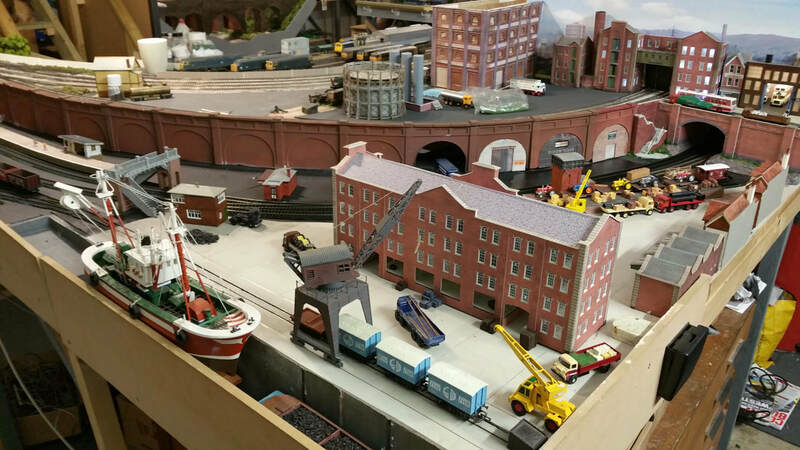 The dockyard trackwork has been painted, the yard plastered, and various buildings are ready for planting, including a factory, gasometer and engine shed. Boats have been obtained for the dock itself, alongside various road vehicles. A new control panel for the main layout is also being installed, with the aim of making the signalling and operation of the layout easier for all members. 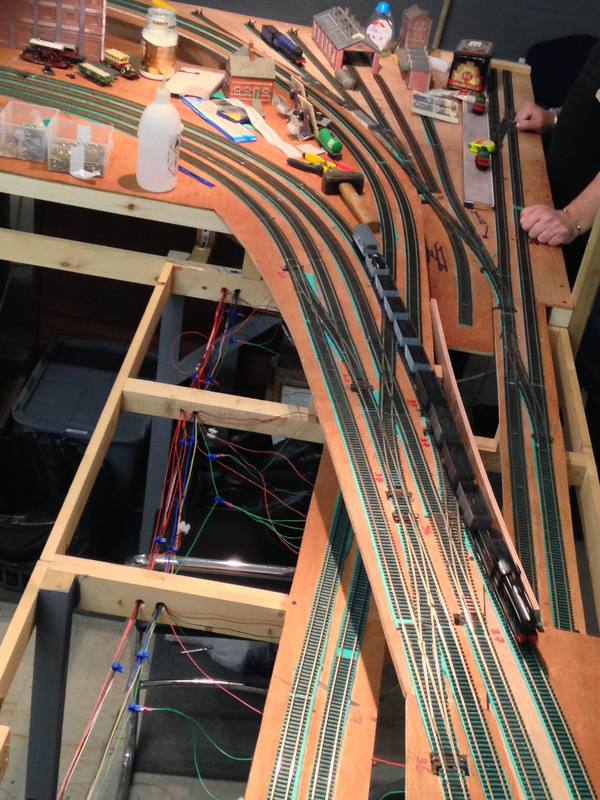 Since the previous update, work has continued to progress on the layout, ranging from sorting out minor wiring issues to longer-term projects. The original control panel has now been 'decommissioned', with the new panel now installed. The majority of the points are connected, and work will shortly commence on the installation of 'route-setting' functionality. On the outer extension, the embankment section has been 'flocked' and ballasted, and now requires a facia fitting. 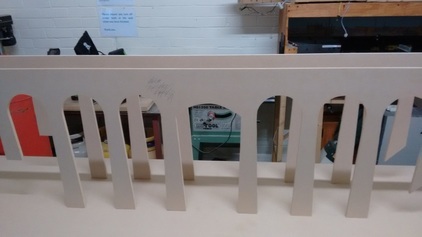 A 'rail-over-road' bridge has also been installed; whilst in the corner behind the footbridge, trackwork for a small yard has been laid and part-ballasted, ready for further scenic work to commence. 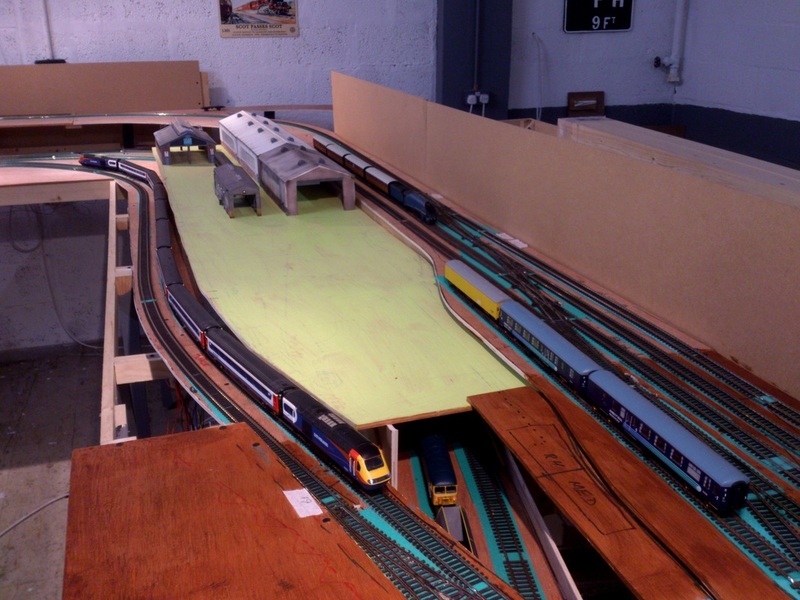 As part of the outer-extension, the lower-level fiddle yard will be extended, and will feed into a lift-up swing-bridge (necessary to allow access to a doorway), which in turn will feed into a short section of 'new layout'. 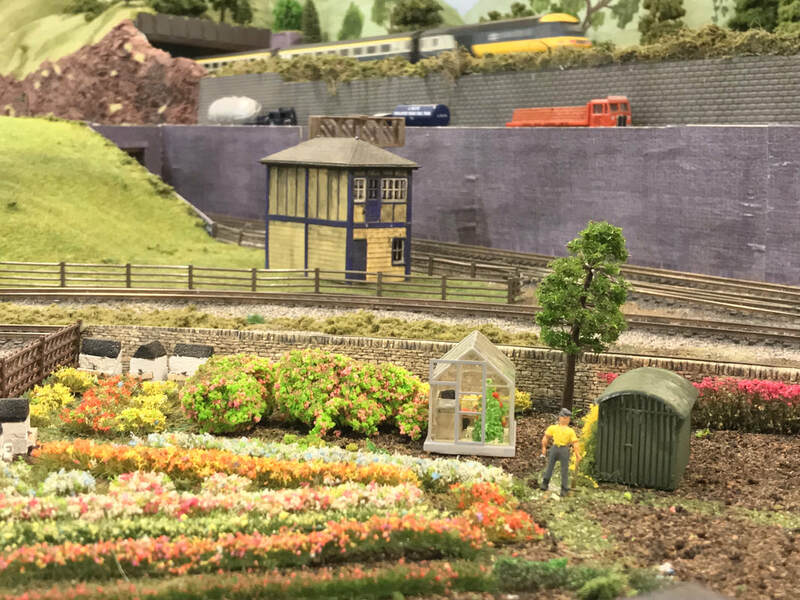 As part of the extension, two former exhibition layouts belonging to a club member will be incorporated into the plan, along with 3 new scenic sections. It is hoped that at least one section will be removable to allow potential future exhibition use. Scenic work continues in the vicinity of the viaduct - the river is now almost complete, whilst foliage is still being added, along with other details. The next part of this particular project is the completion of the canal locks. 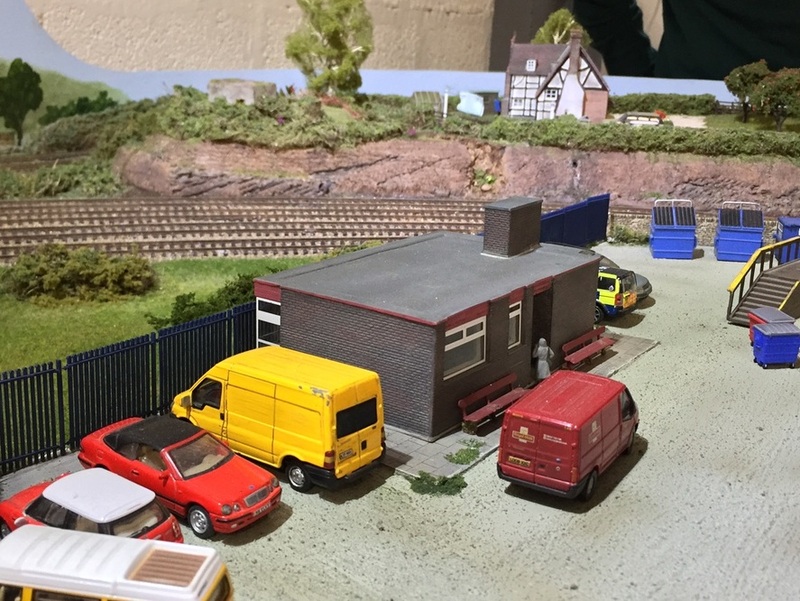 Over the summer, work on the layout has slowed, and other side projects have been taking place, including organising the club's first exhibition. On the viaduct section, the locks on the canal are now being constructed, with the main channel already having been dug out and sculptured. The river has now been completed, with a partially sunken barge on one of the banks, and a jetty on the other. 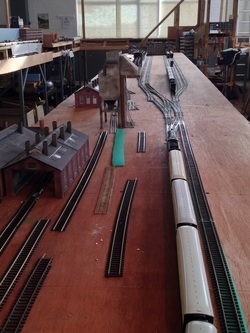 On the outer extension to the layout, operation of trains is now possible, as the wiring has been extended. 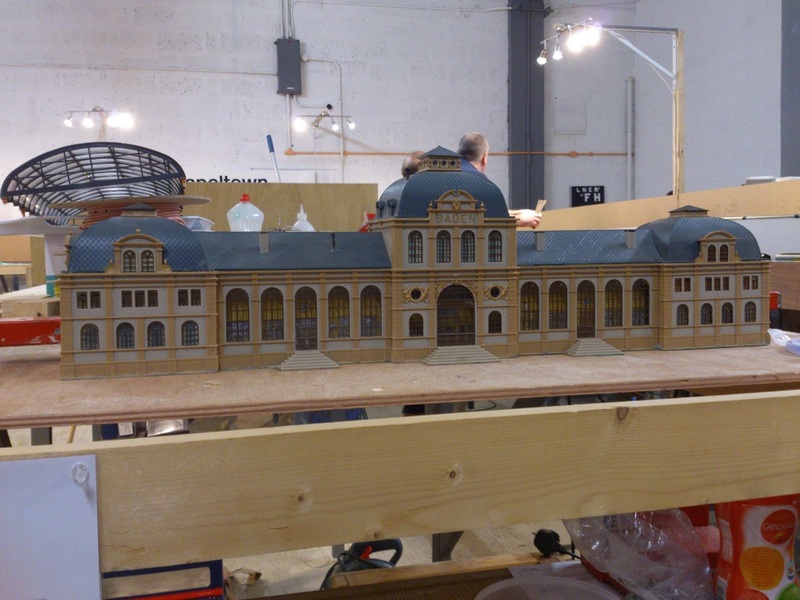 The embankment section requires a facia fitting, and completion of scenery on the wall-side. 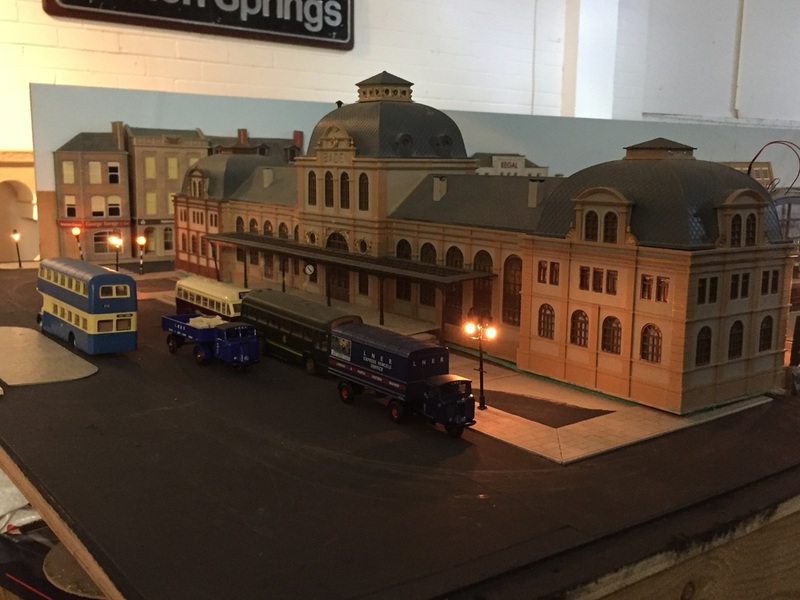 The engineering depot in the far corner has had a roadway added, and now requires painting and buildings planting. A further development, also on the outer extension, is the fitting of a removable bridge, allowing another continuous run along the extension into the lower-level fiddle yard. 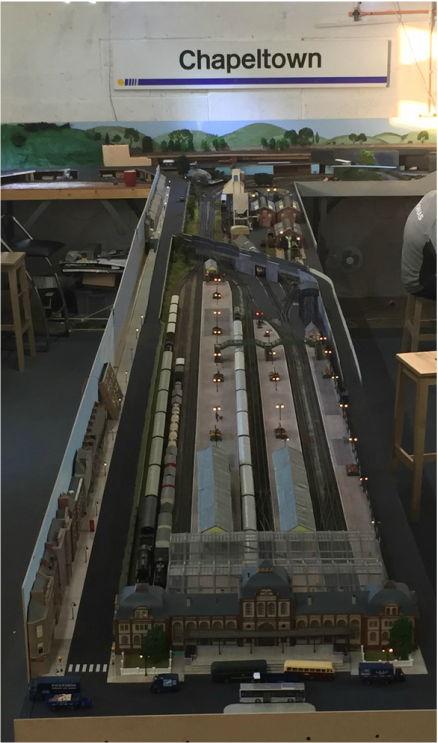 Once trackwork has been completed in the new depot area, and integration of a pre-existing depot layout donated by a club member has been finished, there will be yet another potential routing for trains on running days. ​A (belated) Happy New Year to all our followers! 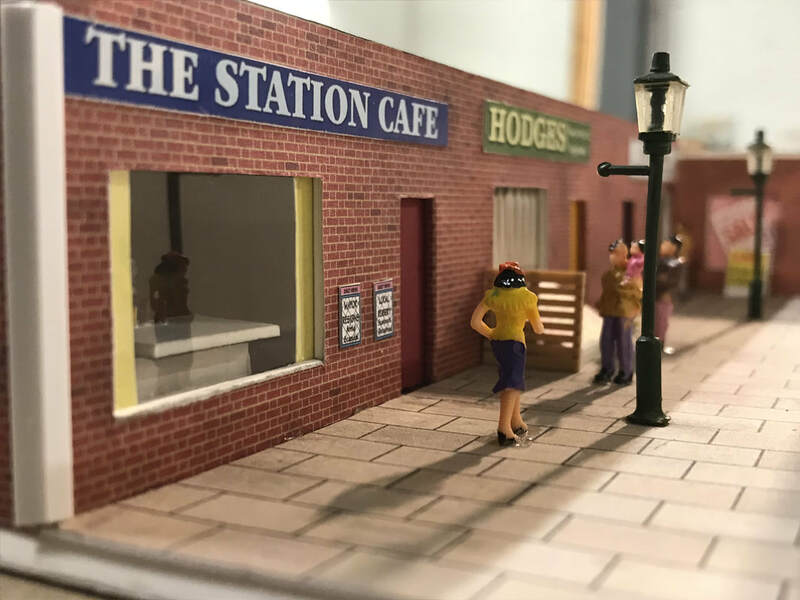 ​Over the winter period, the club has been embarking on new projects, some of which have diverted attention away from the layout - the main time consumer being organisation of the society's first exhibition. 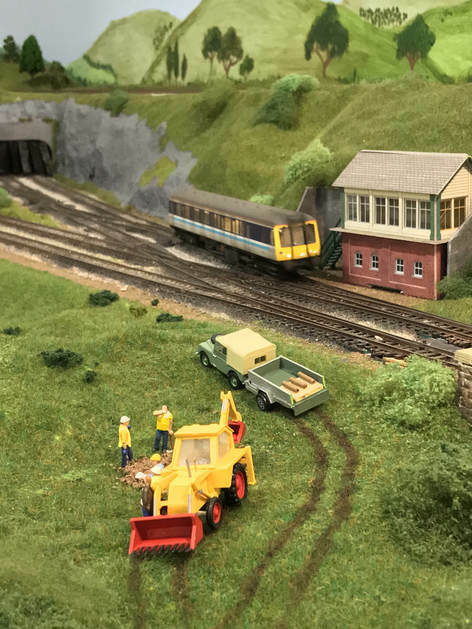 ​On the layout, various finishing details have been added, such as the pipe-digging team (left), and allotments by the peninsula entrance. The riverside is also now virtually finished, with a house now in-situ, and work on the canal now at an advanced stage. 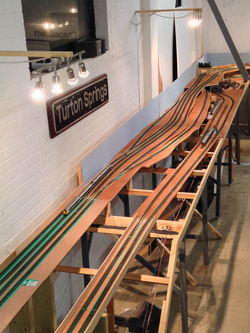 Another development on the layout during the Christmas period was the completion of the outer-circuit. Incorporating two previously-constructed layouts, plus two new boards, and an extension to the lower-level fiddle-yard boards, there are now 3 different routes around the lower-level of the layout. An unusual feature of the new section of the layout is a lift-out 'bridge' section, complete with warning lights when the bridge is in place. Electronically, a new control panel is in place and now controls the vast majority of points on the layout, complete with route-setting functionality. Certain sections of the layout will retain local control however. Since the last update, the club has been working on projects away from the layout (including the exhibition!). 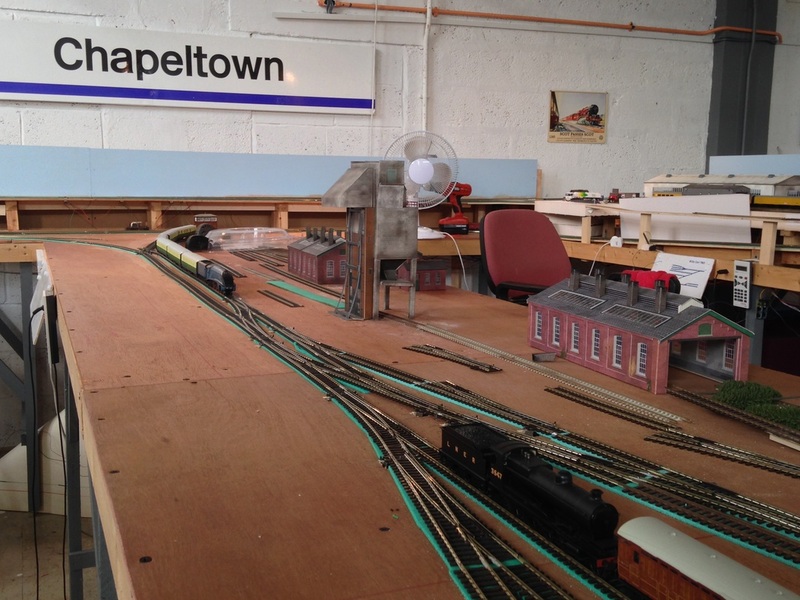 One project that has commenced recently is the building of an 'O' gauge layout, occupying a section of the 'social' room - this has required a shuffling round of the club's magazine and book library and some chairs, but work can now start on building the baseboards. 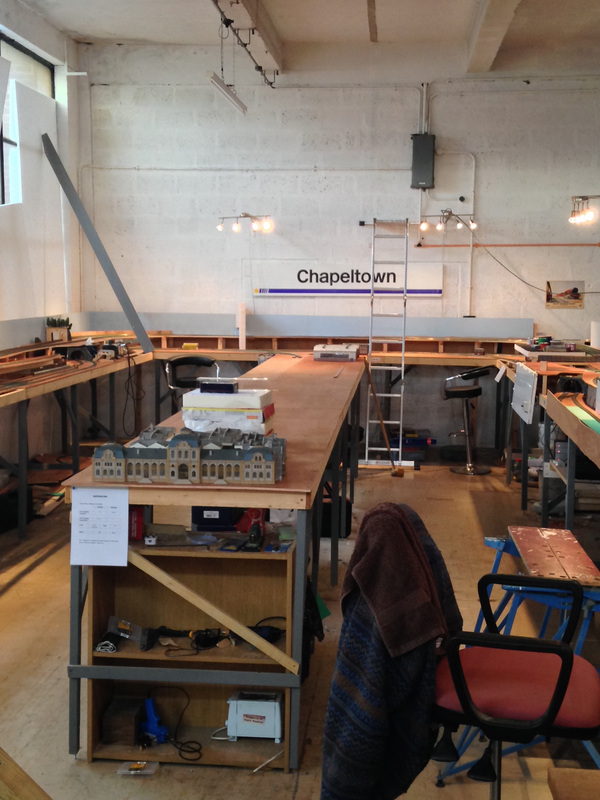 Another ongoing project is the renewal and improvement of the wiring on the layout. This includes modifying the point and power feeds, enabling 'wireless' control via mobile phones using JMRI software on an old laptop connected to the Lenz DCC system. 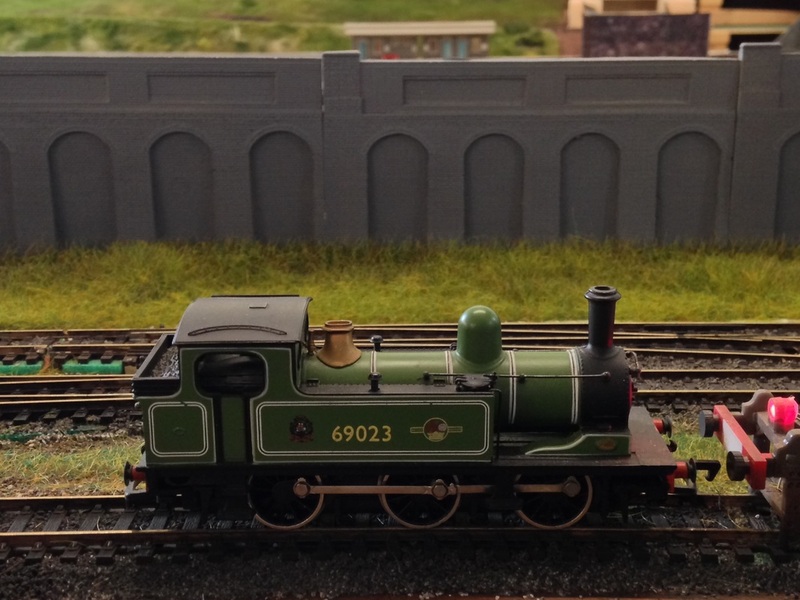 One of the most impressive additions to the layout recently has been the new station building for 'Effingham Junction'. 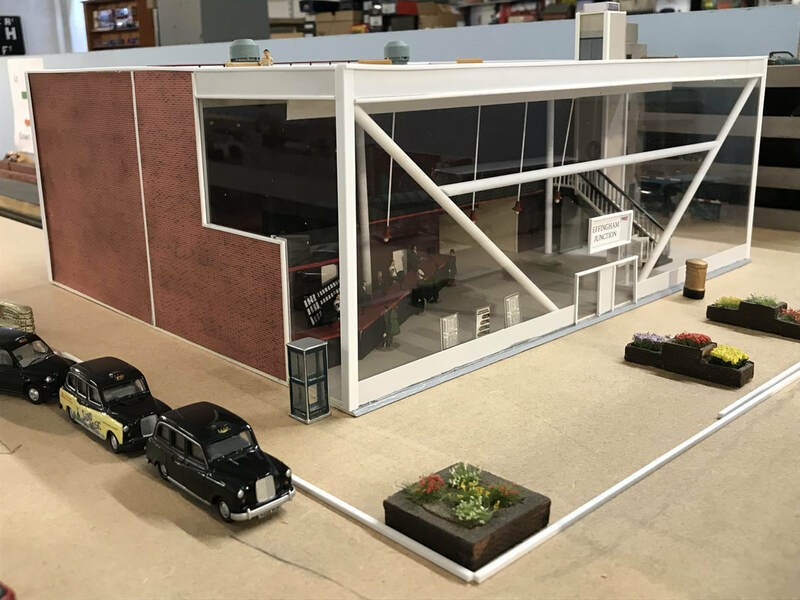 Scratch-built by one of our newer members, it features a ticket office, rooftop garden, viewing balcony and lift shafts, complete with figures. In addition, a pair of small shopping arcades fit adjacent above the platforms. Over the past 3 months, projects within the club has taken some interest away the main layout (we don't want to rush it!). 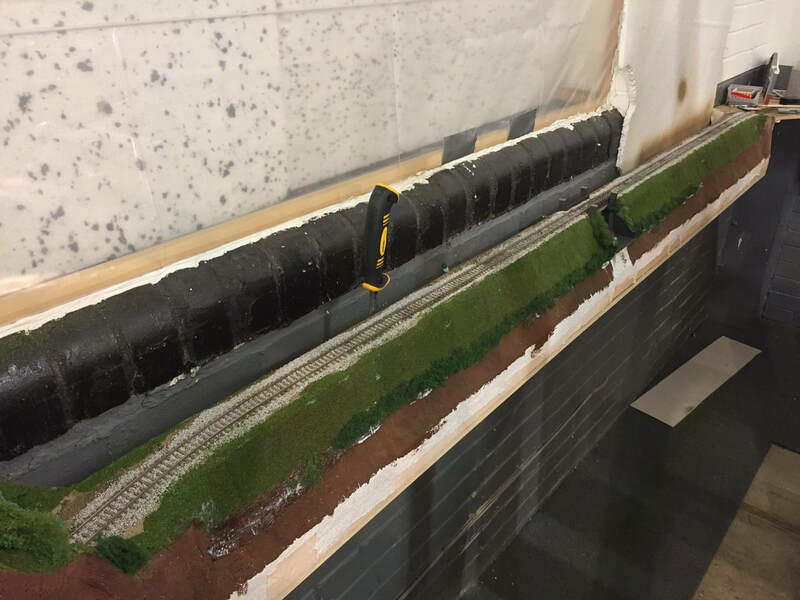 A small group within the club have constructed an 'O' gauge layout along one side of the smaller clubroom - so far the baseboards have been built, and most of the track laid. 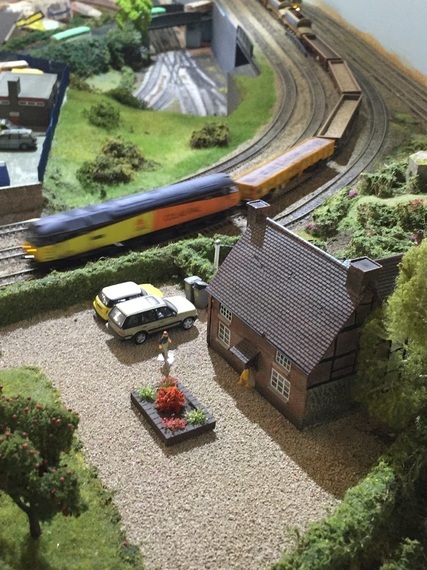 The fiddle yard is a modified traverser, donated to the club by one of our members. 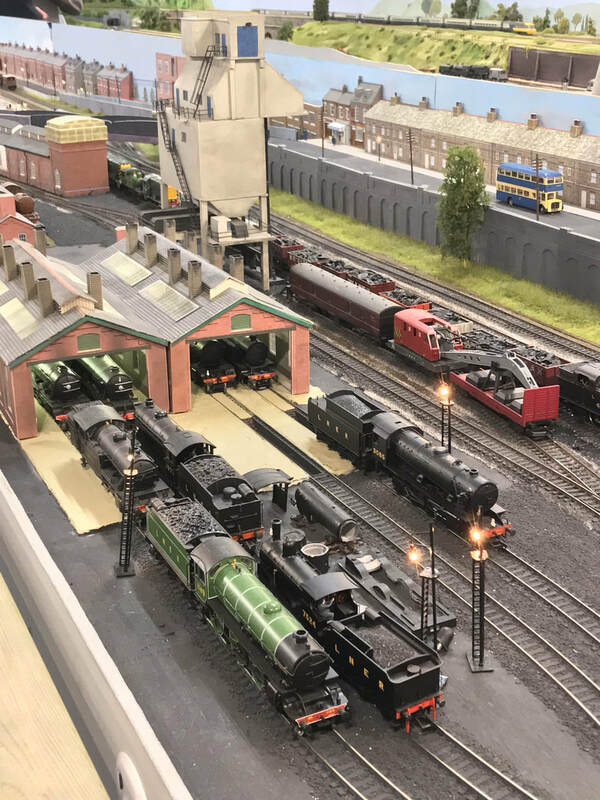 Our membership has had a growth spurt recently as well - an influx of 5 new members has taken us to capacity, and has meant that more time has been spent running trains rather than building and modelling. 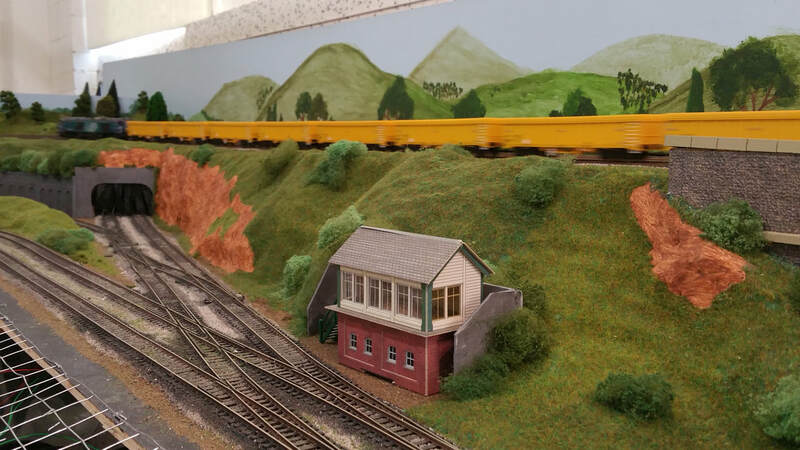 As for actual work on the main layout, our 'electrical department' has been investigating a couple of issues relating to the triangular junction at the end of the peninsula - certain trains create a 'short-circuit' when travelling over one side of the junction. Hopefully the problem will be rectified soon.